Cheesecakes are decadent desserts made of either American cream cheese or ricotta cheese. They are more akin to giant custards than cakes, and, as such, cheesecakes often have complicated baking directions designed to prevent the cheesecake from cracking while preserving a rich uniform texture. New York style cheesecakes are cream cheese mixtures baked without a water bath and are unique because the baking starts at a high temperature (that's quickly dropped down) producing a rich interior and light brown exterior. The major ingredients in almost all plain cheesecakes are cream cheese, sugar, lemon juice, vanilla extract, egg yolks, whole eggs, and either heavy cream or sour cream. The ratios of these ingredients determine the final taste (tangy or sweet) and texture (dense or fluffy). My recipe starts with a quick preparation of the crust. Assemble 4 ounces of graham crackers, 1 tablespoon granulated sugar, and 4 tablespoons of melted butter. 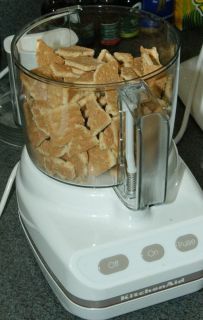 Break the graham crackers into small pieces and place into a food processor. Pulse the food processor until the graham crackers have been reduced to fine pieces (about 10 one second pulses). (The crackers can also be broken by placing them into a large resealable plastic bag and crushed by rolling a pin over the bag.) Then, in a medium bowl, mix the sugar and butter with the crackers until all the crackers take on a wet appearance. Melt one tablespoon of butter and use half of it to butter the bottom of a 10 in. springform pan. 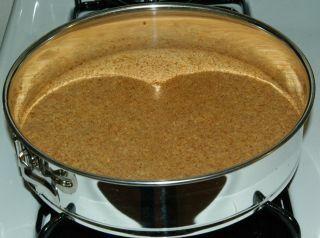 Then, pour the graham cracker mixture into the pan. 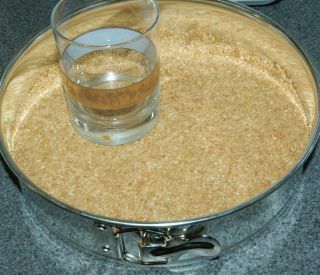 Use a flat bottomed cup to press the cracker crumbs down into an even layer. Use a flatware teaspoon to press in the outer circumference of the crust. Bake the crust for about twelve minutes at 325°F. Once the crust has become fragrant and turned a golden brown, remove it from the oven to cool on a wire rack. When the crust has cooled, use the remaining half tablespoon of butter to butter the sides. While baking the crust and letting it cool, assemble and prepare the filling: 2-1/2 pounds cream cheese (at room temperature), 1/2 cup heavy cream, 1-3/4 cup sugar, 1/8 tsp. salt, 2 tsp. lemon juice, 1 tsp. vanilla extract, 2 large egg yolks, and 6 large eggs. 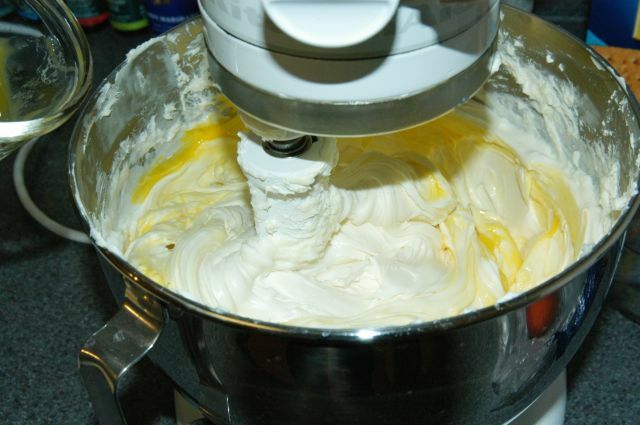 Cut the cream cheese into small chunks and place the pieces into work bowl of a standing mixer. Beat the cheese on low until smooth, about two or three minutes. It may be easier to beat half the cream cheese first, followed by the second half. Once the cheese is smooth, add the salt and about a third of the sugar. Beat until integrated and scrape down the sides. Add another third of the sugar and continue to mix until the sugar is mixed in. Then add the final third of sugar and mix in. Optionally, three tablespoons of flour can be added with the sugar to help add a bit of stability to the cake. Adding flour will not affect the taste or texture of the cake, but will reduce the likelihood of a cracked cake. Add the lemon juice and vanilla extract and mix. Scrape the sides down and add the heavy cream. The cheese should be much easier to work with at this point. Add the egg yolks and mix until they are blended in. 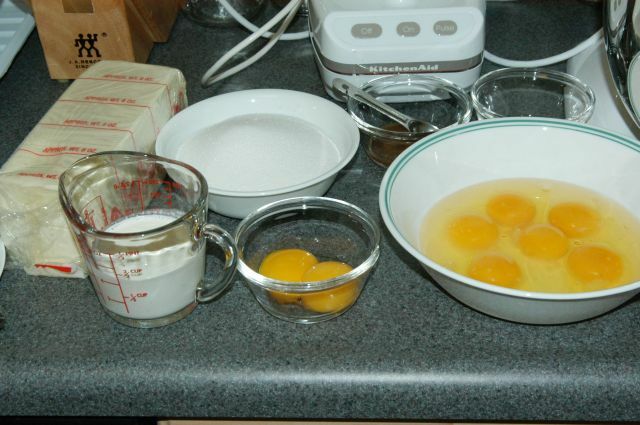 Now add three whole eggs and mix until the eggs have been completely mixed into the filling. Scrape down the sides and beat in the final three eggs. Now, pour the filling into the springform pan onto the cooled crust. A 10-inch pan should fill up to almost its rim with this filling. Lift the pan an inch or two above your counter or cutting board and drop it to bring any bubbles trapped inside to the surface. Place the springform pan onto a sheetpan (for easy handling and safety), and slide into the middle of an oven preheated to 500°F. The cake will not fully set until fully chilled, but the cooling process should be gradual. First remove the cake from the oven and onto a cooling rack. After a about ten minutes, run a paring knife along the rim of the cake to release it from the walls of the pan. This will reduce the risk of cracking as the cake contracts and tries to pull away from the walls of the pan. Joy of Cooking also recommends the practice of covering the pan with a large bowl for added insurance. The bowl helps keep the heat in as well as some moisture which further slows down the cooling process. After about two to three hours of cooling, wrap the pan tightly in plastic wrap and place the cake into the refrigerator to chill for at least five hours. Remove the cake from the refrigerator about thirty minutes before serving and slice with a sharp knife. Use a tall glass of warm water to dunk the knife into between cuts to make slicing easier. The strawberry glaze from the Strawberry Glazed Angel Food Cake works well with this cheesecake. 4 oz. 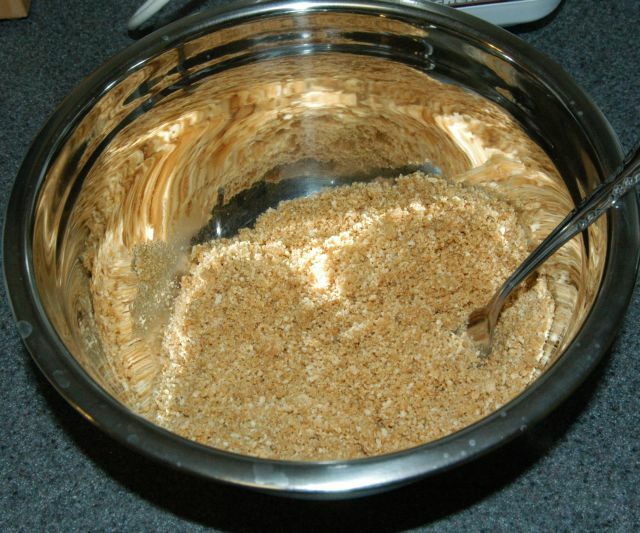 (110 g) graham crackers process to crumbs mix form in 10-in. springform pan bake 325°F (160°C) 12 min. This looks fantastic and not at all as complicated as I thought it would be...this looks like a good first project to break in my new KitchenAid mixer that I got for Christmas! I have read in numerous places that you need to be careful not to overbeat a cheesecake batter. I've never had a problem with the top cracking, so I suppose I must not be overbeating it. Or is there actually no basis in that advice? If there is, what is it? Why would overbeating cause the top to crack? As I understand the potential problems while making a cheesecake, overbeating does not contribute directly to a cracks forming on the surface of the cheesecake. However, overbeating could introduce air bubbles into the batter. If these air bubbles are around while baking, then the bubbles could expand causing the cheesecake to rise. Then, the bubbles will burst (because a cheesecake has very little in terms of structural support - no flour) and the cake will fall. The solution? Use low speeds on your mixer and help the air bubbles rise by lightly dropping the cake before baking. A popular "trick" is to run a knife in a multiple 'S' pattern through the batter after it's been poured to help release air bubbles. Cracking occurs for a variety of reasons. The three most likely reasons on a cake this size is rapid cooling and under or overcooking of the filling. 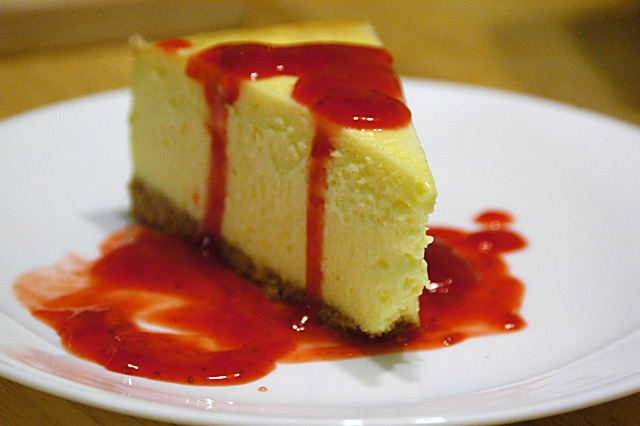 A cracked cheesecake does not affect taste, but it might be an indicator of texture. The cheesecake shrinks a little when cooled. When cooled rapidly, the cake may not change shape uniformly resulting in a fissure forming through the middle of the top of the cake. It's best to cool it slowly in a warm, moist place. Some recipes suggest cooling in the oven (after it's been turned off), but this takes a really long time and may not be perfectly safe since the cake is kept in the bacterial danger zone for many hours. If the middle of the cake is not fully cooked, then it might also crack during cooling. Using an instant read thermometer ensures the center of the cake will cook enough to coagulate the eggs while not overcooking. In addition, adding 3 Tbs. all-purpose flour to the recipe (mix in with the sugar) will help bind the cake without a noticable change in texture or flavor. In fact, now that I'm thinking about it, we should include this 3 Tbs. flour whenever we can. I'll add it to the recipe. The last way I'd expect cracks to form is in the oven. If the center of the cake completely solidifies, the surface will start to crack as more and more liquid evaporates. This used to be a sign that the cheesecake was done, but in fact the interior is a bit overdone. Also, you'll have an unsightly top to your cheesecake. Many of these cracking issues can be avoided by baking in a water bath, but then it wouldn't be New York style anymore. Table says "100min" text, "10 min"
The table is correct. Please bake the cheesecake at 200�F for 1 hour and 40 minutes. This will sound like a really stupid question to any Americans, but could you describe what gordon crackers are like? There's no such thing outside the US, at least not where I live. From the image I'd say they look more like biscuits than regular crackers (as in cheese & crackers). What would you advise as a substitute? Many European cheese cake recipes use Zwiebeck as a substitute for grahm crackers in the recipe. Don't forgot to make crumbs out of these cookies and crackers... Have fun. In my experience, cracking occurs when the cake spends too much time baking at too high a temperature, but that doesn't necessarily mean the interior is overdone. I've done tests keeping the oven at an even 300-350 for the whole baking time, and the cakes cracked like the devil even though the final color and texture were good. The problem lies in the fact that the filling doesn't cook uniformly. Solidity starts at the outer surfaces, then works its way in. Cracks occur when the solid layer at the top is about 1cm thick and the filling has puffed enough that the surface is fully domed. Basically, the custard can't stretch enough to take the stress (custards are notorious for low tensile strength), so it breaks and you get a panful of tasty fault lines. Puffing does *not* occcur uniformly, though. It starts as a ring around the edge of the pan and then moves in to the center. The trick to getting a good, light cheesecake is to have the puffing stop just as it reaches the center, then maintain that level of puff while the rest of the filling solidifies. Give the cake too much heat, and it will crack. Give it too little, and it will collapse.. you'll end up with a bowl-shaped, crumpled top. The key to controlling puff is knowing when to switch the oven from 500 down to 200. You don't want to wait until the top is fully domed, because the filling will continue to puff while the oven temperature falls, and you'll get cracks. Nor do you want to drop the temperature too early, because the center won't puff and you'll end up with a bowl. 10 minutes is a decent rule of thumb, but really, you have to watch the cake. I personally drop to to 200 when the un-puffed zone at the center is about 4-5cm in diameter. That happens to be the sweet spot for the cakes I usually make. Your mileage will vary based on the diameter of your pan, the depth of the filling, the amount of air you've whipped into the filling, humidity, your oven, the phase of the moon, and who knows what else. Just assume that your first two or three cakes will be ranging shots, and figure out what works best for you. That bit of timing is the 'secret' of cheesecake, though. This recipe sounded so good, I made it yesterday. We had a small slice with breakfast this morning and my wife declared it the "best cheesecake ever!" It was delicious. Light and fluffy inside and a little denser on the edges. 1. The post says to cook the crust at 350, but the listing at the bottom says 325. 2. I didn't fully understand the part about the tablespoon of melted butter on the bottom of the pan. Are you saying to use 1/2 tablespoon of melted butter? It was confusing because you never mention what to do with the other half. 3. My cake developed a large crack around the other edge after only 20 min. I thought most cheesecakes cracked during the cooling, not the coking. I will mention that mine didn't turn brown after the 10 min at 500. so I gave it another 2 min. Maybe that had something to do with it. Nonetheless, it was a delicious cake. Thanks for the great recipe and site. Whoops. I made a mistake. The crust should be baked at 325�F for about 12 min. I don't think baking at 350&176;F would hurt anything. Ah, yes. I left out the all important line: "When the crust has cooled, use the remaining half tablespoon of butter to butter the sides." So, yes, use half a tablespoon for the bottom and half for the sides. Sorry. You really had your work cut out with the responses from this recipe! One comment - the term 'graham crackers' is confusing. Are they like ritz or jatz (i.e. flaky) or are they like biscuits (i.e. crumbly)? To overcome the language barrier, perhaps you could describe what they are made of in order for us to work out what they are. I think they are actually available here (in Australia) under a different generic name. Graham Crackers are known as digestive biscuits in the UK. Hope that helps. BTW, you've probably heard it a hundred times before, but I think your cooking instruction graphs are excellent and a very good idea. I've had terrible cracks from time to time--mostly they occur because I forget to run a knife around the edge immedimately after taking it out of the oven, and then again before tossing it into the fridge. When I remove it from the oven, I cover it with loosely with a paper towel and then again with plastic wrap--the paper towel becomes very moist and droops onto the cheesecake, but comes off easily. I'm not sure if it helps keep the moisture in while letting the heat out, but I haven't had a crack when doing this as well as remembering to run a knife around the edges. For cutting, I've been told the best way to cut it is to take dental floss and press it through the cheesecake, and then pull it out. this is a post for jeremy and anonymous who asked about graham crackers. the best substitute we have for them in australia are shredded wheatmeal. for this cheesecake, the shape of the biscuit (cookie/cracker) is inconsequential, although you may experience some inconvenience for those recipes requiring the biscuit to be used whole. a teaspoon of ground ginger in the crumb base is not a bad addition to the recipe, it a adds a certain something. Well I tried the recipe, and had rather unfortunate results. 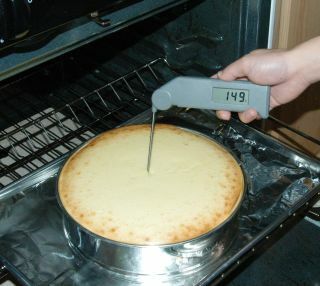 Upon removing the Cheesecake from the oven, the top looked great, and using an instant-read thermometer the center was about 153�F. At the time the center of the cake was still really gooey, but the recipe said it'd set once it was fully chilled. The next morning I pulled out the cake, and the center is STILL gooey. It may have something to do with my springform pan being a little deeper (at 9", holding all the filling with some room to spare). Any suggestions on how to salvage this expensive trainwreck? I hope this response isn't too late (it probably is), but you can try freezing the cheesecake. In general, fully cooked cheese cakes freeze really well. To thaw, just place them in the refrigerator over night and they should be ready to eat the next day. This freezing, may help to set the center of your cheesecake a bit more. That helps with the what to do, but why did it happen? I'm not sure. It could be that your instant read thermometer needs recalibrating or the combination of humidity, atmospheric conditions, cooling properties of your pan and environment, who knows causes the cake not to properly set. I would suggest to bake the next cheesecake a little bit longer or try leaving it in the oven with the door cracked open for ten to twenty minutes after you've reached 150�F. Ideally, we want the temperature over 150� but as close to 160�F as possible - but going over 160�F almost always results in cracking. One of the difficulties of cheesecakes is that you need to make them a few times to get the recipe just right for your ingredients, oven, and location. After investing the time and money, you've got a dessert that everyone will be fighting to get their hands on. I just tried this recipe for a birthday present for a cheesecake lover... it worked great, aside from some problems at the start (mixing the cream cheese killed the mixer I was using.. I probably should have warmed the cheese more before starting). I ended up with some gooeyness at the center of the cheesecake as well, but not too much. I actually cut the cooking time a little short, so it didn't surprise me. I didn't remember to look for a thermometer while looking for a new mixer, so it was mostly guesswork. Thanks for this article, I'm sure I'll end up experimenting more with it in the future. I would like to mix the butter and crackers only without adding the sugar. Any comments ? Those substitutions will work just fine. It seems that digestive biscuits are the same thing as graham crackers. In the U.S. graham crackers are made sweet, so the addition of the sugar may not be necessary for those who don't like strongly flavored sweets. Philadelphia cream cheese is a brand of American cream cheese, so that will work well. In fact, Philidelphia cream cheese is the most popular cream cheese in the United States - so no worries there! very basic Q.. when u beat the cream cheese, do u use a K-beater or the balloon whisk on ur KA (KitchenAide)? and what speed did u use? Thanks! I used the flat beater (not whisk) to beat the cream cheese. I started on low and moved up in speed as the cream cheese began to become smooth - then I slowly stepped up to a low-medium speed (about a 4 on my mixer). When adding ingredients, I moved it back down to low to reduce the possibility of splatter. Well, I just tried this recipe and it was going fine until the very end--I was too afraid to open the oven door and mess with the temperature that I couldn't see that the oven (even though the dial was turned to 200) was actually 300 degrees F! The cheesecakes are cooling now, and I hope that they didn't get too terribly damaged (the thermometer reads 200 degrees at the center of each one). One thing I dont get--and this is probably from an inexpert understanding of physics--is how if the cheesecakes are in the oven for an hour and forty minutes the center never reaches the same temperature as the oven. Shouldn't they be reading 200 degrees as well? (Well, obviously they don't since there was a 100-degree difference in mine.) Why is it that the heat doesn't permeate that far? My thermodynamics is a bit rusty, but a few estimates can be made if we make some simple assumptions. A 10" cheese cake has a volume of approximately 2600 cm^3 (mL). If we approximate that cheesecake has the density of water and the specific heat of water, then it takes about 10.9 kJ to raise its temperature by 1�C (4186 J/kgC� * 2.6 kg). Starting at 20�C and ending up at 100�C, the water needs to gain about 870 kJ of energy. This means it takes about 9600 seconds or 2 hour 40 minutes for a body of water the size and shape of cheesecake to reach an average temperature of 200�C. Likewise a calculation based on 90 W entering the water/cheesecake approximation, shows that after 1 hr. 40 min, 540 kJ of energy has been added to the cheesecake shaped water, raising it's temperature by 49.5 C� to a final average temperature of 69.5�C or 157�F. Of course all of these calculations are real crude especially since a cheesecake is a bit more complicated than a fat cylinder of water, the specific heat and emissivity of water is not constant (varies a little by temperature), and we don't take into account the pan or conductive heat. (I did quickly glance at how much heat would be conducted from the air to the cake, but it looks like it would be less than a watt, so I ignored it.) Otherwise, this is probably a pretty good estimate. My oven here in UK has GAS MARK 1, 2, 3,4 etc. Therefore i'm not sure which mark should i put in order to bake this cheesecake. I really wanted to try your recipe. Hope u could help me in this matter. I think 500�F is around 10 Gas Mark while 200�F is a little lower than 1/4 Gas Mark. I suggest using an oven thermometer to see what setting on your oven equates to 200�F since you're going to need to set it lower than the lowest marked value (usually 1 Gas Mark - some ovens go down to 1/4 Gas Mark but we need a bit lower). Each additional Gas Mark is another 25F�. I must say this is one of the best basic cheesecake recipes I've found. I use it quite often by itself, or as a base for flavored cheesecakes. I've had zero problems with the recipe. In terms of the "gooyness" in the middle that some have reported I recommend this. When removing the cake from the oven, after running a paring knife around the edge-cover the cake with a larger pan and let it cool to room temperature. This will take along time but will set the cake nicely with no sudden drop in temperature. I then refrigerate until cold and then freeze. Freezing the cake is the easiest way I've found to get the cake out of my expensive pans. All in all I don't think you can go wrong with this recipe. Thumbs Up to Michael! 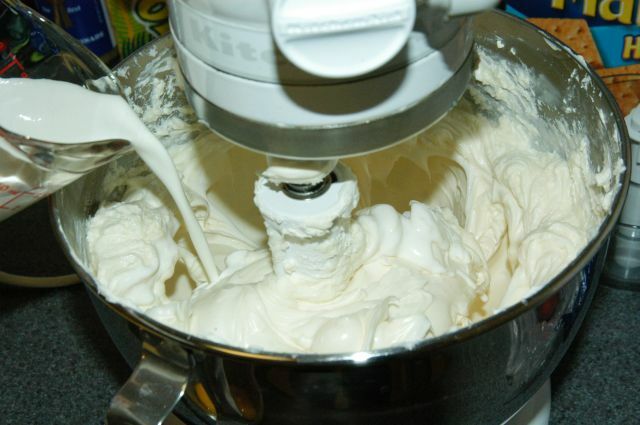 I don't have an electric mixer... do I HAVE to use an electric mixer for mixing the cream cheese and stuff? Would it be a nightmare to mix those ingredients just by simple tools such as... spoons? Seems like a legitimate question to me... and yes, I would say it would be a nightmare to muscle through the cream cheese by hand - but it can be done. Let the cream cheese warm up to room temperature before trying to work with it or you might pull a muscle. If you're using spoons make sure it's nice and sturdy. I'd probably recommend a large spatula (like the ones with silicon spoon ends) or a wooden spoon so you can push your way through the cheese effectively. It's going to be a lot of work and you probably won't end up with the same texture when compared to using a stand mixer, but with a bit of perserverance and some muscle, you should be able to pull it off. I have been trying to figure out what makes a cheesecake dense or fluffy...I love fluffy cheesecake but it seems I always come out with a pretty dense one. I have read quite a few recipes that call for whipping the egg whites into soft peaks and then folding them in...will this help? And what ratio of ingredients help make a cheesecake fluffy? Digestive biscuits are suggested as a suitable alternative for British cooks trying to follow American recipes, but they are not exactly the same thing. Since the temp of the oven is 200C, shouldn't your first T read 473K instead? Secondly, the second T term is not a constant of 293K. Wouldn't it be better to integrate the formula with respect to time as T goes from 293K to Tf (final temperature). Note: You need to express the T in terms of time and combine the equations. Bit of a late post (going through the archives). In Australia, you can use Arnotts Milk Arrowroot biscuits (or a generic brand alternative) to achieve the same result. This has been a fairly standard recipie for biscuit bases in my family for as long as I can remember. Hi, I'm a great cheesecake fan, but I prefer the set European cheesecakes to the baked American cheesecakes. Any chance of posting a recipe for a European cheesecake? The flavour and texture is different, and of course it is set in therefrigerator rather than the oven. This recipe for the cheesecake worked perfectly. I made 3 cheesecakes with the amount of ingredients in this recipe becasue I used store-bought crusts. I served the cheesecakes at a party that my fraternity was having and the females said that the cheesecake was "orgasmic." Thanks to you, i got a few numbers that night, lol. I also used the strwaberry topping from the angel food cake recipe and that also turned out lovely. My one question would be, coul I possibly replace the heavy cream with egg nog for the holiday season? It was something that came to my mind while making the cheesecake. I will take this opportunity to introduce myself. I'm 19 years old and I'm a sophomore at the University of Pennsylvania. I'm studying mechanical engineering. When I discovered this website I was quite surprised because I figured that this website would suit me perfectly. However, I have done a lot of thinking and I am now trying to transfer schools so that I may pursue a career in Hospitality Management or Culinary Arts. I love engineering, but my passion for cooking is greater. Once again, I'd like you to know that I'm glad I found this site and these forums and I'm looking forward to staying around. Substituing the heavy cream with egg nog is an intriguing idea. My guess is that it will work, but you may need to adjust the baking time a little. Subject: cream cheese in france ? :) Very happy to read this article and loved a lot all the experiencie put it by the people. Thank a lot. I will do it and hope get it ok at the first time thanks to all. One question though, I have a fan-assisted oven and was was wondering how this will affect the cooking times? A convection oven will decrease the cooking time. How much time does it decrease by? I don't know. Anyone with a convenction oven that can give advice? I'd usually suggest dropping the temperature a bit, but since we're baking at 200°F for most of this, You'll just have to check for doneness earlier. I'd start at least 30 min. earlier in checking the temperature. Great recipe, I made it for Thanksgiving and everyone loved it! I had one possible problem, though. When I took the cake out of the oven to check its temperature it was slightly over 160�F (about 170-180�F). With having no previous experience with cheesecakes I did not know what to do so I just ignored the high temperature and carried on with the rest of the recipe. I followed your directions exactly, what could I have done wrong and if I were to try again what should I do differently? Not much else to do except carry on with the recipe. The only danger with a high temperature is cracking. Too low and the cake may not set. Next time, shave off a little time from the recipe and check earlier. Baking times are always approximate due to all the possible variables (actual oven temperature, humidity, altitude/air pressure, cleanliness of oven, heating element cycling algorithm, etc.). Now that we know your cheesecakes bake faster than mine, just cut off fifteen minutes and check. If it's still too hot, then next time cut off some more time. I know this sounds like a contradiction, but how can I make a low fat version of this recipe? In the past substtutions resulted in lightly colored cardboard delight. What would be suggested substitutions? I made this recipe using a handheld mixer that I bought for this recipe. It took some muscle to control it (and I'm not a small guy), even with the cream cheese at room temp, and there was an issue of throwing globs out of the bowl. I really don't think it would be possible to complete the recipe without a mixer, unless you want to spend hours and hours with a spoon. And likely a couple days of sore muscles afterward. To remove the entrained air after mixing it, I thumped the (plastic) bowl on the counter a number of times, and let it sit for a while before pouring it into the pan. There were a few small imperfections on the finished cheesecake after baking it, where a few small bubbles rose to the surface and popped. They could have been eliminated by letting it sit for longer. There was no problem with cracking. It was quite brown on the surface when I took it out of the oven, something I wasn't prepared for with your photos. But the texture and flavor were perfect, so I assume that's how it's supposed to be. I expected a more "golden" brown. Everyone loved the cheesecake who tried it. Next year I'll be making two, so that I can take one to the extended family gathering. For those who don't have a food processor, I'd recommend crushing the graham crackers by placing them in a large mixing bowl (stainless steel has yielded good results for me) and using the bottom of a heavy glass (such as a pint glass) to crush them, mortar and pestle style. I have found this far easier and simple than putting them in a plastic bag and beating them with a rolling pin. This also minimizes waste. You're going to need that mixing bowl anyway, to add the sugar and butter. This way, there's no wasted bag and no dirtied food processor bowl/blade. 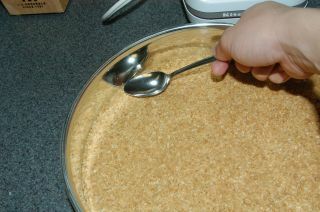 And you can reuse the glass when it comes time to press the crumbs into the pan. Hopefully it's not necessary to say this, but don't put all your weight onto the glass. You're just crushing graham crackers. You don't need too much force, and no one wants to break a glass (possibly casuing injury). You'd have to press pretty hard to break a pint glass that way, but it is possible. So basically, don't be stupid. Subject: Re: cream cheese in france ? Can you not get cream cheese in France? In Germany it's available. Italy, too, apparently, though the Italians I knew referred to it by the brand name "Philadelphia" and had no clue what I was talking about when I said "cream cheese". Perhaps it's the same in France? Perhaps you can get "Philadelphia" cheese, but it's just not called cream cheese? But from what I've read, yes, neufch�tel is an acceptable substitute, but it's less moist and lower-fat. Maybe you might want to add a bit of extra cream (and use a bit less cheese) if you make this substitution. According to this page, cheesecakes made with neufch�tel cook faster and are more prone to cracking, so keep a close eye on it. I make a lot of cheesecakes. I'm quite famous for them and I almost never have cracking on the surface. One tip I picked up somewhere, is that you should bring all your ingredients to room temperature before blending including your eggs. Also, minimize the beating once you get to adding the eggs. And finally, after turning off the oven and running a knife around the edge of you pan, you can actually return your cheesecake to the oven for a couple of hours. I know this doesn't seem like the best practice from a microbiological standpoint, but no one's ever gotten sick from my cheesecakes (except the lactose intolerant who eat it anyway). I am going to try this recipe to see about the texture especially. I tend to make flavored cheesecakes which are usually quite dense, and use a lower egg/creamcheese ratio. Is everyone going to ignore the post about a low fat version of this recipe? I am curious to see if there can be a professional quality great tasting version with low fat alternatives????????? If your oven is giving you problems, I'd get an oven thermometer to see if the oven is hitting the correct temperature. If your consistently undercooking the food, then the solution is to simply either increase the temperature or cook it longer. If you don't have an oven thermometer, then I would probably suggest simply cooking your food longer instead of trying a higher temperature. Some baked goods don't work out well if you bake at too high a temperature and it's impossible to accurately gauge an oven's temperature without a thermometer. I just tried the recipe last night and the result seems pretty good although I had not tasted it yet since it's still setting in the fridge. Your photos/illustrations are wonderful. As it doesn't seem too difficult (shown through your photos) it really encourages beginners like me. I baked a 9" and also used the remaining batter on smaller cake pans (perfect for gifts). I did the 500 degrees for 10 minutes and then 200 for 1 hour and 30 mins. When testing the temperature, my thermometer registered 170+!!! I was so worried but the cake looks fine. It appears as it should, but perhaps overbaking it just results in a stiffer cake? Again, I haven't actually tasted the finish product so I can't say for sure how the texture is. I did remove the smaller cake pans much earlier and they are rather good. I do have a question though. Can the ingredients be combined all at once? rather than doing thirds and halves? What is the purpose of that? I will attempt your other recipes next. Thank you again. We add sugar to the cheese in thirds to help ensure an even distribution of sugar throughout the mix without mixing for a long time. Adding all the sugar at once makes it more likely for clumps of sugar to be deposited in the thick cheese. Let the cream cheese set for several hours until it is soft at room temp. You can even cut it up and throw it in the microwave for a short 10-20 sec. Then just use a stout whisk and a large bowl. Mixing this will take a little muscle work at first, but by the time you add the eggs and cream the batter will loosen up enough to mix more easily. Don't leave any lumps of cream cheese. You may have to do several bursts of elbow grease to prevent lumps, but if the cheese was soft to start with you'l be OK.
You can also use a big food processor with the chopping blade. Mix in batches if needed, then use a decent whisk and a big bowl to combine batches. WOW, Mom and I just took a bite out of this and it is fantastic. I love the texture! Can't wait to get some strawberries on there and have a full slice. Ours is very dark brown around the edges (but still moist - not burnt) and when I took it out it was registering around 160 F, so I think I may have left it a little long. It cracked somewhere in the last forty minutes of cooking so maybe that's related. Fortunately the crack's pretty much right down the middle! I also opened the oven door a couple times during the first ten minutes of cooking at 500 F to check on how much of the cake was rising (a previous poster suggested waiting until the diameter of the un-risen section was 4-5 cm), but almost none of mine noticeably rose more than the rest so after thirteen or fourteen minutes I decided just to bring it down--perhaps that had something to do with it too. Thanks for this amazing recipe! And thanks for making all the recipes so readable. I never "get" the cooking websites, but this site actually makes cooking enjoyable because I know what I'm doing and why. does it change anything if you mix them up in a big mixer? A brown "skin" at the top of your cheesecake is actually a desired appearance for New York-style Cheesecake. It sounds like your oven is still too hot though because your cake cracked. Either lower your temperature a but more (try 200°F) or remove the cake earlier from the oven before it gets a chance to over cook. I read/heard somewhere that using a waterbath will prevent the cheesecake from cracking? So why not use it? I tried this recipe without the waterbath and the cake cracked but the texture was perfect so I don't think it's my oven. 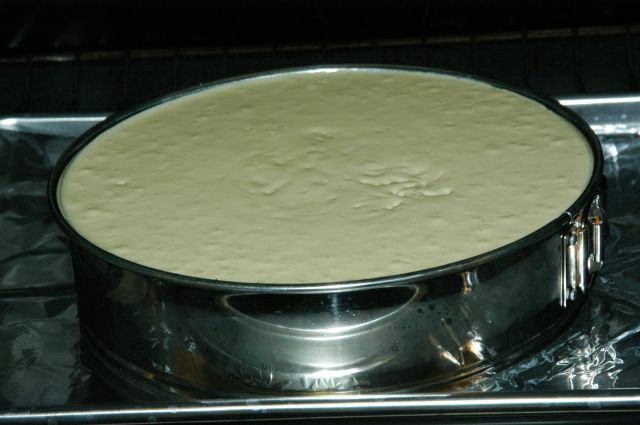 A water bath does cook a cheesecake more gently and provides a larger window where pulling it out of the oven will result in a non crack cheesecake, but then the cheesecake wouldn't be New York style. New York style cheesecakes do not employ water baths. I have to get around to making more types of cheesecake, so my readers will have more versions to choose from. I've tried making the cheesecake several times and they've all turned out pretty okay... But my crust always turns out crumbly and falls to pieces when I cut the cake. Could it be because I didn't crush the biscuits thoroughly? I use digestives, put then in a bag and hammer away at it... Can anyone help? Subject: I love the tables. Very helpful. in the beginning of the recipe you stated the ratios of the ingredients determine dense or fluffy and sweet or tangy. A guest, Stacy, asked on Aug 15, 2005, what ratios would make it more fluffy. I saw no reply. I have been trying to figure out how to make it less fluffy, very creamy, yet firm enough to cut and stay on a fork. To the individual who asked about the low fat/diet cheese cake..
Well, I sorta know why your question has been ignored. I have tryed a few "lower fat" cheese cakes in the past (cooked by me and prefessional chefs) and I can tell you, the best you will get is a dense, tastless, dry cardboard texture and it aint nice! The best you can do is have a smaller serving or just let your self splurge and have a nice scoop of home made white chocolate ice cream a strawberry compot and a big slice of cheese cake! i just want to say that i tried the recipe, absolutely amazing. it seems so obvious to me now that i know it, but i have been trying to figure out how to get the texture so light and fluffy for years without any luck. thanks for posting it! I have tried preheat n bake at 500F. I have a smoking oven! Is that okay? Gradually decrease from 500F to 200F? No, a smoking oven is probably not a good thing. It sounds like you either need to clean the oven (use the self cleaning option if you have it; if not, do it manually) or get it checked out. Most likely it's a cleaning issue - the smoke is from food particles or ingredients that have fallen into the oven from previous baking endevours. As increase in temperature, they start to burn, giving off the smoke. Thnx for the prompt reply. I was wondering whether the smoke could have been a result of the oven temp surpasses the smoke point of the butter used in the cheesecake. And yes, you are correct, my oven needs a major neat scrub. That is unlikely unless you baked the cheesecake for a whole day. The temperature your butter (in the batter) is at when you slide it into the oven is probably a bit less than room temperature - say 65-70 degrees F. By the time you remove it, it'll only have reached 150 degrees. Far lower than the smoking point. What is causing the smoke, is any other material that may be in your oven. Since this material is fairly small, it heats up quickly as the oven heats up and then begins to smoke and burn. I tried the cheesecake and it was great, even though it was my first cheesecake, our oven's temperature is inaccurate, and I have no thermometers. Supposedly it is better than my mom's, and the cat begged for it. 10/10 for this recipe, Michael. Very nicely explained. This is the single best NY cheesecake recipe I've seen, and I've seen (and cooked) many. In fact I was googling for a better one because I was dissatisfied with most of the ones I've seen over the years. How would you rate this cheesecake? Dense or fluffy? I tend to like them more on the dense side. What ingredient mix would I change to get a more dense texture? I read in a previous post that it was fluffy... I can only assume that is the case. I love this recipe, but I am trying to find information on size variations. I want to make an 8 in, a 9in, and a 10 in cheesecake. Would I just use the recipe you have and fill the forms until full??? How would this effect baking times and temps?? ?What do you suggest to make this cheesecake without a crust. Some of my family love cheesecake, but without a crust. wrt. hand mixing: Not (yet) having a standing mixer, I mixed by hand, using a metal spoon. It was hard work, especially to start with, but it got progressively easier as I mixed in the sugar. My cheese was at room temperature as I started (and it was a warm July day, probably 30C/85F). This being the first time I've made this recipe, I don't know if I got exactly the right texture, but it certainly seems right to me. Overall, brown on top and extremely tasty. I screwed up and managed, between fumbling the thermometer and using the thing too late in the first place, to cause a split - but other than that, all is well. Graham crackers: I'm in Germany. You can't (easily) get digestive biscuits or Graham crackers here, but taking normal "butterkeks" worked out fine. By the time it's all baked, you'd never be able to tell butterkeks had played a r�le in the base. Density: goodtogoth, it's definitely dense (at least, mine is). I want to bake this cake but I'm not sure what "heavy cream" is (I'm from the UK). Is it like English double cream? I live in Germany where you can either get very runny whipping cream or something called "creme double", which is like the extra-thick double cream you get in the UK. What is your advice? Or should I just use sour cream? Heavy cream is cream with more fat than normal - about 40%. You can use normal Schlagsahne. In the supermarkets in NRW, you can also get "Schlagsahne wie damals" or something - which doesn't have 40% fat, but does have 35% or something - at least closer to 40% than normal Schlagsahne (about 30% as far as I remember). I used this for my cheesecake, all went well. It's a normal 200ml pot of cream with a cream-coloured lid and brown writing. For other (savoury) recipes where Michael used heavy cream, I've sometimes used Creme Fr�iche, though I don't think that would apply here. Well I was in the supermarket today and I bought "schmand" instead of "schlagsahne" because it's a thicker consistency, although it's only 24 percent fat compared to 30 percent for schlagsahne. "Saure sahne" didn't seem an option at only 10 percent fat. What the hell is "schmand" anyway? Apparently it's sour as well so I thought that was a good compromise! Schmand is sour cream - what the exact difference is between Schmand and Saure Sahne, I don't know, though they're apparently related products, the main difference between them being the fat content (and the fact that Schmand is allowed to contain up to 15% sugar). Good luck with the cheesecake. I just made this cheese cake and it was the first time I've tried to make one. It came out great, but with a slight crack. With some fancy cutting, I just gave myself the first piece with the imperfection. I really recommend letting the cream cheese get to room temperature before mixing. My small mixer almost bit the dust. I tried yoghurt Philadelphia in my cheesecake and it tasted fine. Here in Austria, it is called Philadelphia with yoghurt and has about 1/3 less fat. The consistency was OK as well. Though, I did not have a direct comparison with a "full-fat" cheesecake. I used the "IKEA" recipe. A few years ago, IKEA had a few items called RECEPT. The tray has a complete cheesecake recipe on it ;-) I think I also tried the Better Homes and Gardens variety, but it's already too long since I made a cheesecake... I have to give your recipe a try. My guest from Northern Ireland used "Digestive Biscuits", when she made Banofee Pie while here on a visit. They are very much like our graham crackers and would do the trick for the cheesecake bottom. A biscuit in UK is what we would call a cookie, and our biscuit is what they consider a scone. hi, my name is Carolina and I am from Colombia South America, I have been trying really hard to bake a cheesecake, but there is one ingredient I cant find....Heavy Cream nor Sour Cream....I need help..if anyone knows a replacement for those, or how they might be called...something! please... I looooveee cheesecakes and cant wait to bake one! Try just using normal whipping cream (with about 30% fat). For this recipe, I don't think it will end up making too much difference. I made this cheesecake for Thanksgiving and it was a hit! It's really not hard to make because the mixer does all the hard work. It tastes even better on the second day. The highest temperature of my electric oven is 220C. How many minutes do I have to add to the first 10 minutes of the baking, if I'm baking the cheese cake in this temperature rather that 260. For my own future edification, because this is the fourth time I've done the math: 4 ounces of graham cracker is 8 and 1/3 standard graham crackers (unbroken). Hello, I am trying to make this cheescake in the mini version (4" springform")because I can't afford to give everyone in my family a 10" cheescake. How would I adjust the time for cooking? Also, I thought the grahm cracker crust was suppose to come up the side a bit is this not so? Thanks in advance for your help. My family REALLY will appreciate it! In a springform pan, graham cracker crusts are generally formed on the bottom only. If a side crust is desired, that is often pressed onto the sides by hand. PLeaseeeee answere my question I sent on the first of december about oven temperature. Thanks. I'm not sure, but giving it an extra 5 minutes before turning it down should be fine. Hope everyone enjoys this recipie! hi, I would like to make this recipe, but how would I cook it to use in cupcake sizes?? I would like to make individual cakes. I also do not have a springform, only round cake pans. Would I need to change any ingredients? Baking time and temp is what I really need. It has taken me forever to find a great recipe. You can try the baking times for the Cheesecake Cupcakes recipe. Presumably you'll be making multiple batches taking only about 15 min. each, so you can adjust your baking time for the next batch as each batch comes out to figure out the precise time you need for your oven and pans. Making a cheesecake in a cake round is a problem when it's time to extract the cake from the pan without marring the cake. I think there might be an elobarate way to line the pan with parchment paper (along the sides and covering the bottom with extra pieces acting as flaps of a sling to life the cake out of the pan) but you'll probably end up deforming the cheesecake as you remove it. I recommend putting $10 into a springform. I will ask Santa for one for Christmas. Thank you for answered so quickly. I was in a panic. Have a great Christmas and New Years. If I wasn't so busy working (we have a mushroom website) I would be a bit more likely to take the time to make cookies or something. I'm a fan of the New York style baked cheesecake, and also the European uncooked variety. I want to make a chestnut cheesecake for Christmas by adding puree to the mix which is simple enough for the uncooked, fridge set version. But how do you flavour the baked cheesecake? Several people refer to this as a base for flavoured cheesecake - can you add flavour to the mix and how does this affect cooking times etc? Or is it better to spead a layer of puree on the top of the baked cheescake when it's cooled. It would be interesting to hear people's ideas and recipes for flavoured varieations. After I take the New York Cheesecake out of the oven how long should I wait to run a knife along the sides to separate it and how long before I release the spring form side? Run the knife along the edge after about ten minutes of resting. Release it from the springform after it has fully cooled and chilled. The cake should have shrunk a little, pulling away fromt eh sides that you released it from in the previous step. Subject: What slot should the rack be on in the oven? I just made this for the first time last night and i didn't know what rack position to put it on in the oven. I put it in the middle but it burnt the top during the 500 for 10 minutes. Should i put it on the lowest rack next time? Subject: Re: What slot should the rack be on in the oven? Middle is where the rack should be, but since you're burning the top of the cheesecake, I'd either reduce the time or lower the heat a little (the oven is probably running hot). I am a relocated (to Florida) New Yorker and have always had cheese cake in New York City diners that was very light, moist, fluffy and stood about 5-6 inches high. Everywhere outside of New York City I get dry, dense cheese cake that is advertised as New York Cheese cake. I have read the recipe on this site and it seems to be close but I wonder should it have an ingredient to make it rise? In my family, cheese cake is traditionally made with low fat curd cheese. Comes out very tasty and reduces the fat contend quite a bit. As far as I know, this would be the "normal" ingridient in germany. I have made several cheesecakes. I must say this was the best I have ever done. I followed the recipe to the letter. Cooking in a gas range. Did not crack did not get too brown seperated from the pan . In fact it was almost perfect. Taste and texture was excellent. I will ust this recipe quite frequently. I am not sure if our groceries carry heavy cream, so is heavy whipping cream ok? Heavy cream and heavy whipping cream are the same product. In some areas, double cream is available and heavy whipping is not. Double cream has about the same fat percecntage of heavy cream, so it will work too. I have tried this recipe four times now. The first time, I dropped the temperature after only 5 minutes, and got a white top but very runny texture on the inside. After that, I've kept it in for the full 10 minutes, only to end up with good texture, and a completely brown surface. What can I do to avoid this?? I made a permutation on this recipe, based on my mom's recipe, with some influence from this one, being different in that it had to have real vanilla bean, ricotta cheese in equal part to cream cheese, more eggs, sour cream, and what-not. Anyways, I made it for my girlfriend's daughter's tenth birthday. I told her "I'm making you a casserole, it has eggs and cheese and sour cream in it. It's *Good For You*. But you'd better eat it, or you won't get any cake." The look on her face, (*barf*)and on that of her friends' faces (*gag*), was priceless. Now, miracle of miracles, the kid will eat things that I cooked, and so will her friends. I also made one for my mother, who says at long last my cheesecake is better than hers. But l'll have to take her word for it, because I'm vegan. Seriously reconsidering that right now, as the smells waft across the house. As for my mom's recipe, it came from a Spadina Ave, Toronto, Jewish delicatessen she worked in circa 1962. Wonder if Lottman's Deli is still there. See, this is why, the mom approving of this here cake, well, it's like... praise from Caesar. And I "can't" eat it. Not in a box, not with a fox. Any tips for the tofutti crowd would be appreciated. I once had a vegan cheese cake made from pearl barley. It was very nice, and I hadn't even been a veggie for that many years at the time, at the time I still ate "real" cheese cake, all the same the pearl barley version was very good. Authentic. Baked. Better than the whipped up soft serve version most people are serving nowadays. They are both instructed to introduce the cakes as my own special casserole. Later we will compare notes as to whether the grade four crowd or the grade fourteen crowd is more appreciative of free cheese casserole. Thank you for the help with the baking time and proportions. Even if you left out a few vital ingredients. Twenty bucks worth of dairy certainly warrants another couple bucks for a vanilla bean. And you don't need a mixer. I did it by hand, and I'm a gimp cripple. The kid mixed a bowl up, and she weighs like, fifty pounds. Be a man about it. Or a woman, or a human, about it. Mix it by hand = mix it with love. Baking is a sacrament. Don't knock it together with power tools. Thank you very much for this wonderfull recipe!!! The cheese cake has been great at sea level on the CT coast. We have just moved to Santa Fe, and tried it today. Unfortunately it isn't the same cake at all. My husband still loved it - but it was not what I was looking for. I am willing to try again - and was wondering if I should increase the temperature as well as adding a couple of Tablespoons of flour. Any comments and ideas? Thank you. Regarding high altitude: I live in Utah at about 5000 feet and the recipe works perfectly for me. I use 2 Tbsp. of flour in the batter and cook it for an extra 2 - 3 minutes at 500 degrees. just wanted to compliment on the recipe and the instructions, this is one hell of a cake! hi, i would like to try your cheesecake but if i could have the quantaties 2-1/2 pounds cream cheese (at room temperature), 1/2 cup heavy cream, 1-3/4 cup sugar, 1/8 tsp. salt, 2 tsp. lemon juice, 1 tsp. vanilla extract, 2 large egg yolks, and 6 large eggs. The metric quantities for the ingredients are listed in the recipe summary table at the bottom of the article. The reason why a cheesecake cracks due to overbeating has to do with the breakdown of proteins in the eggs. yes, it can crack from overbeating, after the inclusion of eggs into the batter. Believe me. Took a while to minimize all the stress factors in our process. Also, if you will run a very sharp thin blade (a filet knife works great) around the edges of the cake after baking, the sides will break away from the pan easier, resulting in less tension and less chance of cracking. No matter what you do, the filling will cool faster in some areas, slower in others, and if there is tension pulling it in any direction, a crack will result at place where the most drastic temperature change takes place, usually slightly off center of the cake. There are other factors, but I saw those omitted from the above posts. Let the cream cheese set for several hours until it is soft at room temp. My suggestion is that you press the cream cheese through a sieve before you start mixing it. I am renting an apartment and I have a very small oven that heats up fast. Should I still put the cheesecake on at 500 degrees in the beginning? Since the 500 degrees is the preheated temperature, it doesn't matter if your oven preheats quickly. I recommend starting at 500 degrees. Great cheesecake recipe! I got one problem, after I cut the cheesecake, I put the leftover in a plate and I got some liquid and the crust is not dry anymore, anyone have an idea why I got this problem? I use a waterbath but with a real pan not a spring pan so no chance to have water in the pan. Maybe it's because I don't let cool enough! How long do you let cool the cake? I wait one hour before putting in the fridge! I loved making cheesecake back home in Ohio, but now living in Colorado I just haven't had the time. I finally have the chance to make cheesecake again since I'll be spending Thanksgiving with some friends here. My question though is: how do you correct a simple cheesecake recipe for our 7500ft elevation? Do you have a recipe for pumpkin cheesecake? Last year I had perfect pumpkin cheesecakes, this year my very first cracked all over while cooking. Could it have been from opeining the door to early? I baked at 300-325F only. I do not have a proper thermometer so I am on my way to the store now, but it seems as if my cracks started right away. I am using a recipe that uses 5eggs/ 4pkg 8oz cream cheese/ 1 can pumpkin, brown sugar and 1/4c of flour, and general spices. WOW! My first try at cheesecake and it was absolutely wonderful! Thank you so much for your very explicit directions . . . I will be baking several for Christmas presents this year. I have been baking New York cheesecakes for at least 35 years, first found the recipe in a McCall's Cookbook as Lindy's Cheesecake and then as Deluxe Cheesecake in Good Housekeeping Cookbook. My family is so spoiled by this cheesecake that nobody orders a piece out, because most "New York Style" cheesecakes aren't!! Your recipe is the same as mine except my recipes called for the 3 TBS of flour right along. Great site!!! Can anyone tell me how long you can store a cheesecake safely. Someone told me three days. Do you have to disgard it after three days? Michael or anyone else that might be able to assist, I have made this recipe a few times with my old oven with great results. Now that we have a new fancy Kitchenaid oven, after cooking the cheesecake for an hour, the internal temp. registered 163 degrees. It was very brown on top (one person at the xmas party asked if the cheesecake was burnt) and after letting it sit for 10 minutes outside the oven (with a larger pot covering the top), the top cracked. This wasn't your normal crack either, the entire cheesecake was almost split in half. What gives? I have never had these issues before. For something like cheesecake which contains a significant amount of dairy, we usually say three days. But, they can last much longer - it's up to your own judgment whether or not it is safe to eat. If it has been under consistent refrigeration, doesn't smell, look, taste, or feel funny and it hasn't been longer than a week or so, then you can make your own judgment call. I'm not going to tell you it's okay to eat, because I haven't seen it, but if you're a hardy individual, go for it. If you're prone to illness, elderly, have weak immune system, have a propensity for diarrhea, then maybe you should skip. Sounds like massive overcooking. Your cheesecake is cooking much faster than the recipe, so heat is entering rapidly. This means the sides of teh cheesecake will be much hotter than the interior, so if the center is over 160, then over the next 20-30 minutes, it will continue to rise as the heat from the sides transmit into the interior. The overcooking would cause the cracking when it cools and the size of the crack will be proportional to the amount of overcooking that occurred. Check your oven and see if it's a convection oven. If it is, turn off the convection - we want to slowly bring the temperature up. You can also try turning down the heat (and introducing a water bath to even out the temperature a little) if that doesn't help. Michael, I have options to use either conventional or convection with my oven. I chose to however use the convection and lowered the temperature 25 degrees. So I initially cooked the cheesecake at 475 degrees for 10 minutes and then lowered it to 175 for an hour until I noticed the rapid cooking. Do you think next time I should use the same method however cook it for about 45 minutes or start using the conventional oven and cook it to your recommended instructions? I appreciate your help. Cheesecake is not something you want to cook rapidly. The key is evenly bringing up the temperature of the cheesecake, so lower heat for longer time is what you want. Turning the circulation fans on your convection oven will heat up the outside of the cheesecake way too fast. You can use the convection oven for the first few minutes, but once you lower the temperature, put it on conventional mode and let it cook for the hour and a half or so needed. If you halve this recipe, it takes 60 minutes to cook (measured with thermometer). What if i use a microwave? How would it differ in terms of power and cooking time? for the amateur of dessert a have find this wed site , this really good !! When making cheesecake, can I line the inside of the springform pan before buttering and putting the crumb crust in place? I am trying to stop leakage from the waterbath, and make it possible to simply "lift" the cake from the springform pan bottom once its completely cooled. Will this work, or somehow interfer with the baking of the cake? First let me thank Michel for an excellent site, I know it's a lot of work and a lot of foolish questions and foolish answers. As an Ex-pat living in the Philippines, still liking my home style treats, I do baking on the side as a hobby. Some of the things that I have learned are" no two ovens are the same, you need a thermometer. If using convection oven (counter top) lower temperature 25 degrees and cook following directions. 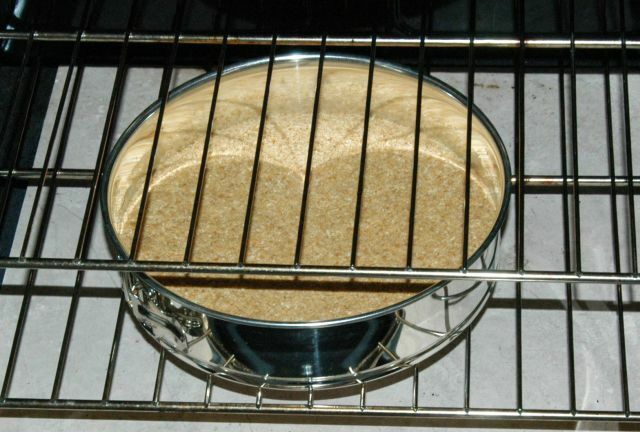 My oven in PI uses the top and bottom element to bake, where in the US only the bottom element is used, so I have to tent my cheese cake to prevent browning or I get that burned look. For the crust try different things, a mixture of ground nuts, cookies, any sweet baked confection. Sandwich cookies (biscuits) are good and require no added sugar, or butter. For non-filling cookies (biscuits) Just add about 4 Tbls. butter to the crumbs. I freeze my pans with crust before I fill it to cook, holds crust in perfect position, and retards cooking on the edge for a short time. As a word of help, don't be afraid to add or try something different, use recipe as a guide, not as a law. After tasting a delicious New York Cheesecake at a coffee shop recently I was inspired to bake my own. I made this recipe yesterday using a 22cm pan and 3/4 of the recipe filling. I baked the cake at 260C for 10mins then at 95C for 50mins. The cake came out of the oven with a couple of large cracks on the surface however the top did not brown at all compared to the sides which were quite brown. Do I assume that my oven did not heat up properly to the 260C yet was overheated when I turned it down resulting in an overcooked cake? Is the best way to fix this to keep the oven door ajar when reducing the temp and reducing the cooking time? 1 1/2" to 2" not done. The third time I let it cook for about 3 and half hours (maybe more, I lost track) and it came out perfect. I love this recipe, the taste is amazing, but should it take that long?!?!?!? I love this recipe, the taste is amazing, but should it take that long?!?!?!? 2. Do you have an oven thermometer in the oven to verify that it reaches 500F and ends up at 200F? Ovens are notoriously inaccurate and their accuracy can change over time also. It seems to me that 3.5 hours is a LONG time for this recipe. First: going out on a limb here....but I am assuming the third time for the cheese cake was not for your third wedding, so I salute your foresight in trying stuff before hanging the proverbial hat on it. so by all means, if you have future plans that include 'that oven' get a thermometer and double check it's dials . . . .
lie in the new oven.... yes its new... hey what a way to test it, huh? Just wanted to thank you for this wonderful recipe, it worked like a charm. I really was looking for the American style cheesecake since Dutch cheesecakes are typically made with Quark and gelatine and 'cooked' in the fridge - they're nothing like the NY style I've come to love so much :-). I'm making it again tonight for a birthday/soccer celebration (it's currently the European Soccer championship and the Dutch team's through to the quarter finals). Anway, just wanted to let you know your recipe is travelling around the globe :-). Subject: Stronger taste of cheese? Hello, I am wondering how I can make my cheesecake have a stronger flavor of cheese, just like the original cheesecakes served in Cheesecake Factory. Do I have to use a different type of cheese (I used Philadelphia cream cheese), mix with various kinds of cheese, use less eggs, etc? Hello, this cheesecake is awesomely awesome, I have baked it a total of 3 times using the guide and instructions. Just one question, does different types of oven cause the cake to bake differently. I use a water-based oven, the kind that uses water to heat the oven up..some new techie...and my cake appears to be brown very quickly and makes it unsightly. The taste is still great though. But I would appreciate it if someone could tell me how do I prevent the cake from browning in the middle too quickly. Hi, I have a question about the crust. I noticed that the crust in you receipe is only on the bottom of the cake. Is there a reason for that. I would like to have mine go up the sides of the cake also. Is there an easy way to do that or is it not even recomended. 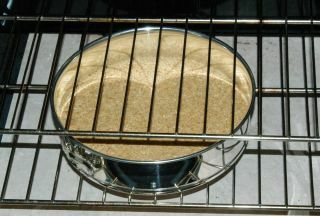 over browning can be reduced by covering the c-cake with aluminum foil for portions of the bake cycle. do double check the accuracy of the oven temp control - "too hot" is the usual culprit for "too brown"
in a spring form pan, the c-cake will shrink just a bit - making for easy removal of the ring - that could be a little trickier with a crust up the sides - but heh, give it a go! well i made the cake, or at least i really tried. for some reason it split all around the pan, in a circle. then, it went black on top, even though i turned the heat down already. still thought it might taste alright though, I think maybe my oven is broken, but the cake when it had cooled (and I cut the top off), it tastes like egg!!!!!! thank god there's a cheese cake shop down the road!! I tried this cheesecake for the first time (first ever homemade cheesecake) since moving to the UK as I don't like the British non-baked version and everyone loved it. So much so that I have now made it for all my friends and given them all a copy of this recipe. I have tried different flavors and lemon is my favorite. Everyone who has tried this cheesecake loves it! Thank you Michael, I will definately cherish this recipe. I have experienced the same problem as you - on an unbaked cheesecake. I believe that as your cream mix thickens, it is obviously losing water content (liquid content) and this goes onto the base. It then "washes" the butter out of the base as it goes through - this happens since the biscuits get soaked and oil/butter cannot mix with water and therefore the butter abondons the biscuit. Since the liquid is not pure water but whey - the end result is a yellow liquid. Made this recipe for my husband's birthday. He wanted the "perfect textured" cheesecake. I crossed my fingers and picked this recipe. It was fantastic and I really appreciated all of the comments from people who made the recipe. My cheesecake didn't crack and it looked PERFECT. The comments from the people who had it were that it was "the best cheesecake I ever tasted." A few comments: I did bring all of my ingredients to temperature. And I did whip all of my ingredients together for a long time, to allow the cream cheese mixture to become nice and creamy. To make sure I didn't have any bubbles I just put the spring form ontop of my oven burner and shook the sides. I also used the "S" technique, of "cutting" the cheesecake to make sure all the bubbles had surfaced. I cooked as you guys said and did end up putting a damp paper towel over my cheesecake as it cooled. I definitely think that helped. Fantastic recipe. Thanks for all of the help! I intend to use it again soon! This is my first time making a cheesecake and it cracked, but I can deal with that (it's for my employees at work and they won't care how it looks! )...This is my first time using a spring form pan. I get that when I release the spring, the sides will come away, but how do you get the bottom off without destroying the cake? [...] but how do you get the bottom off without destroying the cake? You don't. Serve it on the bottom of the springform pan. Just remember to take the bottom back home after the party/work snack time. <SIGH> That's what I was afraid of. I planned on giving one to my son to take home, but he doesn't live close and who knows when I'd see the pan again. Guess I'll have to do the best I can on his and hope I don't tear it up too much. I wonder if lining the bottom with parchment paper would make the bottom easy to remove. you don't get cream cheese in india. so i was just thi nking about using cheese spread ....... is it possible. To the person in India, you can find cream cheese in Mumbai. I have family there buying cream cheese for this recipe. Michael, there was a question above that was not answered, and since I have the same question, I'll ask again. i tried it and it was awesome!!!!!!!!!!!!!!!!!!!!!!!!!!! it didnt crack or whatever. i dont understand how others could crack because they did tell us to use a knife to make sure the sides dont stick to the pan in order to prevent cracking while it contracts(shrinks). it tasted so gooood and it was the perfect recipe for a cheesecake! This is very similar to the NY Cheesecake recipe from Cook's Illustrated, which uses 2.5 oz sour cream instead of heavy cream along with lemon juice and a good bit of vanilla. The Cook's Illustrated version is my favorite--as it's a bit denser from having less liquid and I love the slight tang from the sour cream. I made your version shortly after you posted it, and I loved it as well (I also made it once with buttermilk, because I forgot the heavy cream at the grocery store--that was also delicious!). For those who question how browned the top of this cheesecake should be: it should be a rich almond color (the color of whole almonds). Yes, that's brown! However, that's a main characteristic of this cheesecake--and the cheesecake is not over baked if you do not let it rise above 155 (the temperature of the cake will rise about another 7-10 degrees as it cools). People outside of New York are not used to seeing a cheesecake like this, but this is exactly what it should look like. A well baked New York cheesecake should have an nut brown top, and the texture should be cool and creamy in the center and then feather out to velvet and suede at the outer edges (i.e. the outer edges will be slightly drier than the center). If this isn't the type of cheesecake you want (this happens to be my favorite style of cheesecake--anything else seems lackluster), then bake it in a water bath or find another recipe to use. If you're open to a different cheesecake experience, then this is definitely a recipe to try. Oh, for anyone who is looking for a low-fat version of New York cheesecake, go check out the recipe for Low-Fat Cheesecake at America's Test Kitchen. It's almost as good as the full fat version and uses a combination of reduced-fat cream cheese, strained yogurt, and cottage cheese. The calories are reduced by almost half and the fat is reduced by a third (if a remember correctly). Subject: finding a recipe like new york style at Outback steak house? Hello.. I am new at making cheesecake. I tried today to make one and made the mistake of beating the batter too much. I have a VERY fluffy cake. But what I am looking for is a recipe that is close to what Outback Steak House serves.. or used to serve. They had amazing new york cheesecake. Now they serve something that tastes horrible and I have decided to make my own. I consider myself a skilled baker but I want to get the right recipe. Can anyone out there help me find one that will taste like Outback's???? Thanks in advance for any help. Just line the bottom of the pan with foil (press it well into the creases) before attaching the side of the pan. Then when you remove the side of the pan, the foil can be lifted off the pan and then the cheesecake can be slid off the foil completely in tack. if you are outside the u.s. you can us 'digestive' biscuits as a nearly perfect substitute for graham crackers. marie biscuits or tea biscuits work, but not quite as well since they are really light. I wanna make this reciepe with the strawberry galze, but I have a problem what if I used fresh Strawberry instead of frozen ones, would it affect the process? Fresh strawberries should be no problem. ive read that the ratio of the ingredients for cheesecake make them either tangy or sweet, and dense or fluffy. i'd like to make them tangy and dense, how do i do that? Subject: AWESOME!!! Thank you so much! Hi! This was the first time I tried making a cheesecake. It got RAVE reviews. I made it for someone who is a big cheesecake aficionado-and he said it was tops! Thank you so much! I followed the recipe exactly-I had the time to let it cool as suggested - and it didn't fall. I tried the cheese-cake, it came out wonderful, thanks really! I just wanna ask what if I used 1/2 portion of the ingredients, with a 8.5 or 9 inch springform pan. because last time I used 10 inches springform pan but it came out too high. How long should I keep it in the oven in both tempretures? btw I don't have a thermometer. And will anything else be affected? I use strained yogurt because cream cheese is both expensive and difficult to find in Mumbai. For a 9 inch cake straining 1200 ml of yogurt overnight in cheesecloth is sufficient. I add 400 ml of single cream and 200g of white chocolate also for a different dimension. Also I make it a point to bake it in a water bath which keeps the cake moist and creamy. I add 3 eggs only though and I add the whites after beating them till stiff with caster sugar. It's the day before Easter, I am making the cheesecake and forgot to buy heavy cream! Can I sub anything else? I do not have whipping cream but have yogurt and sour cream. I have made this recipe before and it has always turns out great. What can I do? any evaporated milk on hand? that might work better in cheesecake. plain ole milk would work, use slightly less, won't be quite as rich. Kiri / France reports itself to be a "cream cheese spread"
might be a smidgen difference in consistency but basics should be ok! Can anyone suggest any adjustments for baking 2 cheesecakes together? My recipe calls for 45 minutes at 325F but I've never attempted to bake 2 cakes at the same time. I'm grateful for your replies!!! Michael - you are doing a stand up job here. I just wanted to suggest incorporating the pan size into your grid notation. Not a big deal, but would make it more complete. I just wanted to suggest incorporating the pan size into your grid notation. Good idea, I added it to the table summary for the crust. I just finished baking this cheesecake and while all looks fine, I forgot to add the heavy cream. Is this going to ruin the flavor of the cake? Subject: Do you have to coat the sides of the pan with butter? So when you put the batter in, do you have to coat the sides of the pan with butter/cooking spray so it wont stick when you take it out, or will it just come out by itself? Subject: Re: Do you have to coat the sides of the pan with butter? In a springform pan, the sides come off of the pan by expanding away from the cake. As long as you remember to run a knife around the circumference before cooling, you'll be fine when you remove the side of the pan. Is this the longest running discussion on NY style cheesecake recipe ever or what? Does sound good though and will try but my problem is that the cheesecake nearly always ends up tasting like a cake with a heavy eggy texture. Is this why egg yolks are added to give it richness rather than a pancake like texture? Fantastic cheesecake. I have my second one in the oven as I am typing. The texture was great AND it didn't crack. I did check the temperature before taking out, and I also let it cool in the oven for an hour first. But it certainly is one of the better textured and tasting cakes I've tried. Subject: away wid yo crackers! biscuity crusts are naff - only shortbreadcrust 4 me - for plain or NY cakes anyway. Gotta admit that chocolate wafers round a decadent chocolate cheesecake with booze in it would sorely tempt me. But Charlie Rozensweig's parents' lovely old shop in North Fitzroy had only the shortcrust type. The shop's stained glass windows enhanced the rich, glowing gold of the cakes. Looking at my shnoz, Mrs R asked Charlie if I was "yiddishe". How I wished I was if it meant such beautiful cakes. Subject: Wet, fluffy, dry and dense? I really love cheesecake and i'm interested in trying your recipe, but before i do i need to know whether its a wet fluffy type of cheesecake or a dry dense cheesecake. Texture is a big thing for me, i've denied many cheesecakes because their too moist for me, i want something dry! Subject: Re: Wet, fluffy, dry and dense? I've been making cheesecakes for years, using a number of different recipes (most from the inside of the Philadelphia box). I would love to try this recipe, but I have a question about adding flavorings. A friend of mine has asked me to make a Bailey's Irish Cream cheesecake, and as I've never done it before, I was wondering if it would be okay to just add to this recipe. Would it cease to be NY style if I were to do that? Also, how much should be added? If using a heavy liqueur like Bailey's, could you skip or cut out the heavy cream altogether (as in, substitute 1/2 cup Bailey's for the 1/2 cup heavy cream)? And would the same be true for other liqueurs? I'm thinking specifically Amaretto and Frangelico (Almond and Hazlenut, respectively), though it might be good with something like Sabra (chocolate/orange). After 10 min at 500 deg, the top was *very* dark, almost burnt. I opened the oven and fanned the door to drop the temp faster because I was afraid it would burn. Also, I took the temp first at 1 hr 30 min, and it was already over 160. Might be the oven needs calibrating. No cracks though. I finished with a fig sauce. I warmed up a small jar of fig preserves and strained the chunks out, then added some gelatin to the syrup that was left. I poured it over the top of the cake while it was still in the springform and let it chill and set up. For all the Australians out there, graham crackers are not available by any other name. However, any plain, sweet biscuit (i.e. Arnott's Nice biscuits) can be used, though you may need to cut out the extra sugar for the crust depending on the sweetness of the biscuit. I tend to use Anzac, Ginger Nut, or plain choc biscuits myself. Subject: Fabulous recipe, photos & instructions! Hi! I adore cooking and baking but until now have never been brave enough to attempt a homemade cheesecake... not really sure why... until lastnight. I decided to make one for myself for my birthday and explored many recipes online and decided to try yours. I followed your instructions and ingredients precisely. A few other things I did were to put the eggs out for about an hour prior to cooking to reduce the chill. I did include 3 Tsp of flour and I used the first or 2nd speed on the mixer and only as needed to thoroughly blend, careful not to overbeat. The batter sat on the counter for approximately 15 minutes while waiting for the crust to completely cool. I "dropped" as you described a few times using the back of a spoon to smooth the few air bubbles that came to the surface. The cheesecake fluffed about 3/4" above the springform pan somewhat like a custard (which I didn't expect) and browned a beautiful flat consistant golden brown color all across the top and not a single crack in site! It's absolutely beautiful! After cooling under a large stainless steel bowl (tipped on the cookie sheet allowing some air flow) for about 2 hours I released the springform, placed the cheesecake on a cakeplate with a glass top and refrigerated. This morning, still gorgeous and no cracks and it's all I can do to not have cheesecake for breakfast! I will write more tonight and let you know how the consistency and taste turned out. Subject: and the taste is perfect too! It's so surprising to realize I've waited so many years to try making cheesecake... for fear of failing I suppose... but to stumble onto this recipe and have it turn out not only visibly perfect but also perfect in taste and texture... Hail to Michael!!!! how do I make this cake higher / thicker? can I double the recipe and cook alittle longer at 200? please please need help! i'm no baker and my family loves it when I bake this cheesecake. I would love it if I could figure out how to make it higher. In my last posting I was somewhat critical of recipe results. Meanwhile I purchased a 6" springpan. I mainly cut the ingredients nearly in half except for egg yolks. Much to my delight the result came out exceedingly close to the cheesecake obtained in NY area. Of course it was noted at the beginning of the recipe density depended on the ratio of ingredients. I used 1lb cream cheese, 1 cup sugar, 3 eggs, 2 egg yolks, 1/4 cup cream, 2tbs flour, 1tsp lemon juice, and 1tsp vanilla. This greatly shifts ratio of eggs to cream cheese. I filled the 6"pan nearly to the top (2-1/4"). I mixed ingredients very thoroughly and baked 8min @500 and 1hour @200 with no cracking. The result was smooth and light and very tasty with a little crumble when forked. I'm in heaven! This is an excellent step by step approach to making a cheesecake however to truly make this an engineering quality recipe, it would be remiss not in include checking and levelling the oven prior to insertion of the cheesecake. I asked 2 months ago about adding flavors, and have yet to see a response. I was hoping to be able to make a Bailey's cheesecake for Thanksgiving, and need to know how much to put in and whether or not it would unbalance the recipe. My guess is that no one on this board has tried to modify this recipe with Bailey's and that's why no one has responded - what you shoul dhave done in the last two months is made a cheesecake with a couple tablespoons of Baileys to see the effect and then do it again if you don't like the results - if you didn't like the results but don't know how to adjust to make it how you like, you probably could have asked here to get suggestions, but expecting random people on the internet to test a recipe for you is asking to be disappointed. With a day and a half left, you may still have enough time to make a cheesecake with Baileys and report on your results in time to get some reponses on how to adjust it if you dislike what you created. hmm, a bit too much Bailey's methinks . . .
have made this 4 times now with varying results(appearance, used differant ovens) but bottomline is it still gets," its the best cheesecake i ever tasted" from everyone that tastes it. My neighbor has told me her sister prides herself on her cheesecake and mine blows hers away. Not bad for a truckdriver. time in the fridge depends on fridge temp, covering, how many bugs are floating around in the fridge - perhaps a week - fuzzies will grow on the surface - then you know it's a goner. Could I just use Nestle canned cream? Or maybe even all-purpose cream? I really can't find any whipping cream or heavy cream or double cream here. I have made 3 cheesecakes without any cracking. I do use a water bath. My problem is that there is too much moisture in the cake when done. I cook it at 325 for 70 minutes and the results are much to creamy. Is this and ingredient, mixing technique or cooking temperature/time problem? So, I bought one of those nested three packs of spring form pans. And, I decided to make a double recipe. using a 9 inch and an 11 inch pan. Well, after several "perfect" single 10 inch pan results in the past, tonight's cheesecakes were full of large cracks. The 9 inch cracked right away during the 500 degree stage. I was relieved with the 11 inch holding strong. But, it cracked almost as soon as I took it out of the oven. New pans, new oven... forgot the extra pan of water, and didn't cover it during cooling. Next time I will pay more attention and follow the recipe. this is the best cheesecake recipe i've ever tried. it's delicious. my family inhaled it and it was gone within 30 minutes. thanks! Tried this recipe for Christmas. The first one went to my stepdaughter's family (including my grandchildren) who pronounced it excellent. The second went to my lady friends family (two daughters and two grandchildren) who also pronounced it excellent, except for one grandchild who refused to eat anything that night. Regarding comments about splitting the cheesecake top--does anyone REALLY care?? If this is a concern, cover the thing with strawberries or chocolate sauce. Whoever gets the piece(s) with the cracks will have some extra topping. Consider it a plus. All in all, an excellent recipe, easy to make. Question-- has anybody tried this recipe in the cupcake form? I know there's a cheese/cup/cake recipe on site but I seem to like this one quite a bit. Someone asked this above, but I didn't see a response. Is it OK to cook this cheesecake without a crust at all? I have celiac disease and cannot eat gluten. It is possible to get gluten-free graham crackers of a sort, but actually I like the cheesecakes better that don't have crusts. Any modifications necessary or just leave it out? you can just omit it entirely - some 'styles' have crust on the bottom only, some bottom and sides, but their absence won't affect the filling proper. if using a spring form, you probably want to give a look at the bottom-to-side junction to be sure it won't leak. Just purchased an 11" kaiser Springfrom pan which is made in Germany. It is so well constructed I highly recommend it. The bottom rim on this thing is amazingly tight so leakage would be difficult. Nice closure on this pan as well. I purchased mine at Chef Resource. com because they had the best price and free shipping. Cost was $50.00 but should last a lifetime if not longer. Things I may have done wrong: Did not have any moisture in oven, may have overbeaten slightly but not sure since I was aware to not overbeat, my ingredients may have been to cool and not completely at room temperature, and I substituted sour cream for the heavy cream. I used sour cream twice in each cheese cake and maybe that is what caused the cracking? Would anyone happen to know what proportion of sour cream I really needed to replace the heavy cream I did not use? Any ideas are appreciated. This is the best cheese cake I have ever made. I love the ease and format with pictures of all your recipes. I can't wait to try this recipe for an upcoming dinner party. I only have an old-fashioned meat thermometer. Will it give me an accurate reading and how far into the cake should the point be? Outstanding recipe! Many thanks for sharing! Yesterday I made this cheesecake for a friend's birthday, it was just how I remember NY cheesecakes to be. No more visitng the city and having to dash straight away for a taste of of my favorite kind of cheesecake. I can now satisfy both my own and my partner's thrill of eating delicious NY cheescake. Avoiding cracks... and bubble blemishes! Because I have an electric oven, I placed a rectangle cake pan, half full of water, on a shelf just under the cheesecake. I unintentionally used cool water in the cakepan, not warm as suggested, and worried if the temperature of the oven would drop too much,yet the cake turned out great, flat across and no cracks or bubble blemishes. All ingredients were roughly room temperature before starting. I used a hand mixer for everything but the eggs which I incorporated by hand,one at a time, to avoid overbeating and getting air bubbles with the mixer. I bumped the bowl of mixture on the counter before putting it into a pan. Also, I bumped it some more , dropping the pan on the counter! And finally,I ran a knife in figure eights through the mixture,to break up trapped bubbles,before placing the pan into the oven. During the last 40 minutes of baking I set the oven to about 205 or 210 because my oven light was going off and on when it was set at 200. This spooked me as I thought maybe the oven was not warm enough. The light seemed to stay on when I raised the tempurature a little. It was the fist time I used the oven at such a low setting so I did not know if the gauge was faulty or not. I never opened the oven durng the entire process. After the 100 minutes I tested the center and it was at 160. I moved it from the oven and quickly ran a knife around the edge. Then I placed a large pot over the cheesecake as it sat on a cooling rack to cool for two hours. Then to the fridge. The taste and texture were divine! No cracks! The slight lemon flavor-- especially appeciated. Oh, yea,the cheescake was not brown on top, just golden, my partner said it looked like sunshine. It was a pleaser. Thank you! Thank you! Can I use a 9-inch springform pan, or does it have to be a 10-inch springform pan? 9 inch will work just fine. do not fill it to the brim - it puffs up a bit as it bakes / sets. if you wind up with extra batter toss it or put it in a smaller ramekin & bake a little chef's treat . . . There's another recipe I've seen that's very similar, called Lindy's Cheesecake, and it uses a pastry crust. Could one use that crust with this recipe, and would that affect baking time? Other wonderment........the Lindy's recipe calls for 5 eggs and 2 yolks, and 1/4 cup cream, whereas this one calls for 6 eggs and 2 yolks, and 1/2 cup cream. I guess my biggest question would be...............with the egg amount, cream amount, and the type of crust being pretty much the only differences, could I bake the Lindy's recipe exactly like this recipe? Sorry if this is unintelligible, I'm trying to sort out my questions as I ask them. :) Thanks so much! Oh, and all my springform pans are (I think) dark non-stick pans. How should I adjust the baking temp/time? Also, I don't have a thermometer. Any suggestions as to how to tell if it's done? you want to use a different crust and a different recipe for the filling, and the question is "does anything change?" the basics are all the same - kill the clock and go by feel. 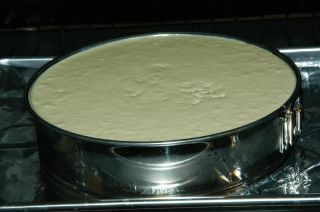 a cheese cake filling is essentially a custard - when it sets up to a firm point in the middle, it's done. the best tip I've seen/learned to avoid cracking is: when done, turn off oven, leave oven door cracked/propped open; allow cheese cake to cool slowly in the oven. I used a different recipe because i only had a 9 inch pan and my cake cracked. Im not sure why but it did. does anyone have any advice? My first attempt was about six months ago, a sort of disaster, because I was using the continental conversions, and I misread the second bake as 200 degrees centigrade instead of 93 degrees centigrade. Ouch! We knew something was wrong when we could smell burning. However, I say as sort of disaster, because after it cooled down, we sliced it, cut off the burnt top, and it was fantastic, far better than any commercial cheesecake. No cracking either. Second attempt last night and I used a different brand of digestive biscuit for the base. Unfortunately, whilst the top has turned out a textbook study, perfect colouring, texture, and unbelievavable taste, the base is a slight let down, partly due to the taste of the different biscuit, and partly due to the fact that I think I may have over processed them resulting in a slurry rather than a crunchy base. Remember kids, don't drink and bake. Re: the above, I forget to mention, the reason why I even bothered to make a second attempt, was because the kids so enjoyed the first disaster, they kept hassling me to do it again. I've tried doing this cheesecake twice and I always have the same issue. First of all let me tell you what I changed. It's impossible to find heavy cream here so I used evaporated milk instead (as recommended earlier in the posts and throughout the internet). I start at 260 �C. My oven has �C degrees instead of �F, but it still won't go as low as 96 �C so after 10 minutes I leave it at about 110 �C or 120�, after 45 minutes I check the center of the cheesecake with a toothpick and I turn the oven off until no food comes out on the toothpick. The oven uses gas not electricity, and if I try to lower the temp. from 260 to 120 it will go off and its dangerous so I have to start lowering the temperature gradually until it gets to the lower temp. When the toothpick comes out clean, I leave the door closed until it cools down. The cake tastes great, but the problem is that it kind of rises a little bit on the edges then it goes down so the sides of the cake are taller than the center, and after I chill it on the fridge, it comes out even lower in the center. No one that I've seen here has noticed that problem since they don't really know how a New York style cheescake ( not even me ) and I use the "basket" kind of shape to fill it out with fresh strawberries to hide my bad looking cake, which happens to make peolple here like it better. Can anyone give me advice on what I'm doing wrong or what would be a best way to bake this cake? the air heats, expands, things puff up. the difficulties controlling the low bake temps you mention could be the basis of the problem. 'fixing' the oven could be a bit on the tricky side. one classic approach to creating an even bake is a bain-marie - the water bath helps even out the temps of the baking pan. just be sure the pan does not let water from the bain-marie seep into the cheese cake crust . . .
First I'd like to thank the engineer that gave us this marvelous recipe. I've been making this cheesecake now for over 2 years and everyone loves it and says it's the best cheesecake they've ever had! I too have had issues with the cracking, though minimal, and I find it best to drop the pan on the counter as suggested and running a knife through it as well. Use of a large stainless steel bowl over the top while cooling also helps. People have been posting comments about your cheesecake for nearly five years, and rightly so. Thankfully I found your recipe, followed your instructions, and took the cheesecake to work to share. Everyone raved about it. My cake was quite yellow because I used local, "free-range" eggs. Thank you so much for your careful website. Hi I am trying to cut calories and make this as sugar free as I can. can you use sugar substitute like equal or splendar? I know that it may not taste as great but I need to for a friend who is diabetic..
tried this recipe. after about 7 minutes at 500, my cheesecake was so burnt on top that I'm pretty sure I'm not going to eat it. this is a pretty mediocre 25 year old oven, so we're not talking about some over-efficient oven. and we're not talking a little brown. I've eaten a lot of new york cheesecake and know that beautiful light brown look. we're talking burnt here. I love cheesecake but rarely find one worth eating. it is funny how hard it is to find a good cheesecake. I thought from the comments this might be it, but this first experience was a real turnoff. tried this recipe. after about 7 minutes at 500, my cheesecake was so burnt on top that I'm pretty sure I'm not going to eat it. this is a pretty mediocre 25 year old oven, so we're not talking about some over-efficient oven. and we're not talking a little brown. If your oven was able to burn the top of your cheesecake in 7 minutes, I would highly suggest getting an oven thermometer from your local kitchen supply store or online. Do you think if I want to add a banana flavor to the cake, can I just add some mashed bananas without changing the rest of the ingredients? Or will adding mashed bananas will make the cheesecake too soft? Thanks. If I want to add a layer of raspberries in this cheesecake, how would I do that? Would I need less moist in the rest of the recipe because of the moist in the raspberries? Or would I have to add something to the raspberries to make it dryer? I hope someone can help me with this -- I want to make this cheesecake next week, but preferably with raspberries (as you understand) because plain style is not really to my taste. And if I wanted to make a lemon-cheesecake, I guess I would have to add lemon-juice but leave some other juice/moist out of it, in order to keep the moist/dry-balance perfect. And would I have to compensate for the acidity with extra sugar? Any help would be appreciated. Thanks so much! I know that the recipe calls for the whole cake to bake on a temperature of 500�F for the first ten minutes, but the design of recipe card seems to suggest (in my view) that only the crust bakes on that temperature... or am I mistaken? I think I will add the sourcream to it, as someone suggested from the Cook's Illustrated recipe. I do notice though that that recipe also calls for much less eggs than this one (and someone above complains that it tasted 'eggy'). Well, we'll see. I just make the CfE-recipe (I'm even going to try to get some heavy cream and graham crackers from the local British store, since normal stores don't sell that here) and maybe later I will adjust. The thing is: I'm a bit nervous making the cake. Yesterday I had cheesecake at the local 'Bakkerswinkel' here in Utrecht, and it was just heavenly. Best cheesecake I ever had. And I have had cheesecake in the Cheesecake Factory. So there you go. yup. there are two sections in the chart. the top section refers to making and baking the crust - the bottom section is the 'whole thing' - crust and filling. heavy cream is just that used for whipped cream / schlagtsahne - methinks there's plenty available around Utrecht (g) - all that fluffy white stuff I ate had to come from somewhere . . . Thanks for the quick answer, but when I look at the second chart (the one I was talking about), and you look at the bottom ingredient, which is the crust, then the thing saying that it should bake at a temperature of 500degreesF comes from that ingredient. The one after it, baking it at 200F, talks about all the ingredients. There the line is vertical all the way. Otherwise the lay-out is confusing indeed. Look at the ingredient before the crust, which are the 6 large eggs. The task to mix it in in halves only refers to the eggs, right? Not to all the ingredients. I'm really pretty sure (saying 'or am I mistaken' was just to come across as modest) that the line before the task to bake at a temperature of 500F should be vertical all the way. That's all. In the end I bought the Dutch 'slagroom', which has 30% fat, but there is a difference with heavy cream if I can trust Wikipedia which says that heavy cream has a percentage of at least 36%. I just checked the recipe tables in Firefox, Internet Explorer, and Chrome for PC and I'm sorry to say that only firefox is rendering properly right now. I'm traveling right now, but I've made a note to myself to look into fixing this when I return. Well, whatever the opinion is about the chart, which clearly differs here, the cheesecake turned about absolutely fantastic. I had a bit less creamcheese as planned, due to forgetting one of the cups of creamcheese (a sixth of the total) which I saved with the sourcream that I had bought as well. I did the crust with brown sugar like someone suggested and cooked the vanilla in the cream as someone else suggested. I read the lemonjuice wrong and added instead of 2 teaspoons at least 2 tablespoons. Further I added 250gr of very wet raspberries (I used a box with frozen ones, so when it defrosted it got hugely moist). I figured that the cake would be pretty wet and skipped the added waterbath in the oven. The cake turned out lovely. It looked lovely (I made pictures - I wish I could add them here) and so it tasted. And so I ate my first self-made cheesecake ever along the route of the Amsterdam marathon while all the marathoners looked on jealously. The taste of the raspberries I can recommend to everyone who likes them as much as I do and the cake absolutely didn't taste too lemony from the extra juice. Thanks very much for this great recipe! Mr chu or/and assorted cheese cakers lovers I am in need of your help! Many years ago I had a frozen store bought cheesecake that came with a top layer of gelatine with berries, strawberries or the more delicious blackberry variation. It was very balanced, not sweet but just the right sour taste to go with the rest. The cheesecake filling was clingy but still not gelatinous, and whilte smooth had that subtle sticky "cream cheesegrain" and was more dense that not - it stuck to your tongue. Taste hard to put down, but a sweet, rich mild, perfect flavour. Completely devoid of the dreaded lemon, or overly gelatinebased and light stuff that is the common rule for what can be found locally (I'm in scandinavia). And with a slightly salty kick from the biscuit base - which wasn't just like dry and crumbly digestive and neither like spongecake, but something inbetween - quite moist. Maybe just wellprepared digestive/biscuits. Anyyway; I can not hope for you to identify this particular readymade cake, which I am almost sure must have been some recipe sourced globally in a larger chain and put under some brand towards UK/Europe. But what style of cheesecake might it have been? I am not sure if my vague description is of any use, but who knows. Maybe some idea of where to start? There were no signs of it being baked, no crust. Just yellow-white cheesecake. No true New York Cheesecake has a graham cracker crust -- it detracts from the pure flavour -- use short dough. I'm sure you've heard too much of the cracking, but since I'm still an amateur for cooking, I'd like to have your opinion as to what happened to my cake. I used half of the ingredient in a 9" spring pan, with glass bottom and steel side. I preheated it to 500F then baked for 8 minutes without fan since I since my cake is half your size and maybe half of your height. The cake looked brown on the edge, and the top looked really puffy but no crack at this point, and it looked white still. Then I reduced it to 200F cracked the door open (I know you said don't do it, but I thought it would help the temp to come down) for a few seconds, then kept the cake there for 1 hour without fan (convection). I think about 30 minutes into the cook I found a huge crack in the middle of the cake, but I kept cooking. Then I took it out and did all the steps you suggested without any problem, the cake didn't further crack during the cooking process and it tasted really really good. The top layer of the cake still looks white, like the original color before I baked it, with just a little dark brown on the edge. From all the cracking post I read, it sounded like I baked too much in the 500F environment, so that the top solidified too long which caused the top to crack, right? So instead of 500F for 8 minutes, should I reduce to 5 minutes? Or you think it has more to do with I left the door open during the temp transaction from 500F to 200F? Thank you so much for your post. I love cheesecake and finally found a recipe that makes sense. Let me preface this by saying that Michael Chu must be the devil incarnate. I made this cheesecake for the first time about two years ago and now my daughter will not invite me to dinner unless I bring one. As I write this, the 2010 Thanksgiving version (I think it's the tenth one I've made in two years) has just come out of the oven. A few things. I have used the ingredients exactly as listed in the original recipe except I've used jumbo eggs instead of large. Don't know if this matters but it works. The optional flour has always gone in and cracking has been held to a minimum. I have cheated on the graham cracker crust by buying a preformed graham cracker pie shell and breaking it up into small pieces before putting it in the springform pan. Crust prebake step is eliminated and it does work. My changes have been in procedure. First, the order of ingredients doesn't seem to make any difference. The key seems to be time and speed. The mixer should be set at the lowest possible speed to keep air entrainment to a minimum. Bowl scraping is mandatory as, at low speed, much of the cheese will stick to the bowl sides. When baking, resist the temptation to open the oven door for a peek. The full size cheesecake recipe works very well with the times given. PREHEAT to 500 F. BAKE for 10 minutes at 500 F. DECREASE setpoint to 200 F for 100 minutes. DO NOT OPEN THE OVEN TO DROP TEMPERATURE QUICKLY. After the 100 minutes, remove and cover with an INVERTED plate for the first cooling. The inverted plate collects condensate and routes it to the outside of the pan rather than dripping onto the cake. Avoid the temptation to put the cake in the refrigerator for speedier cooling. In fact, leave the cake alone until it's at room temperature, about 4 hours, before refrigeration. Remember that the cake is still cooking for a while while it's cooling, as eggs solidify at 158 F.
With regards to the previous posters-- a TRUE New York JEWISH STYLE cheesecake uses cream cheese and eggs. The original Arnold Reuben recipe (Turf Restaurant) used animal cracker crumbs for the base. A New York ITALIAN STYLE cheesecake uses ricotta cheeses instead of cream cheese. Junior's cheesecake, arguably the best in New York, uses either shortbread or brownie crumbs for the base, depending on if it's a traditional or chocolate cheesecake. As far as using half the recipe ingredients for a smaller cake, DON'T DO IT as you're changing the thermodynamic properties of the final mass. The smaller cake will cool faster, not allowing the eggs to solidify completely and contracting faster, thereby causing increased cracking. You could probably do it by controlled cooling, dropping the 500 F bake time slightly, then decreasing to 200 F gradually over one hour. I think the cracking was the result of thermal shock with the outside contracting much faster than the inside. If you're truly concerned about the cracks, make a strawberry or raspberry cheesecake. Follow the recipe, let everything refrigerate, then top with sliced strawberries or raspberries (the frozen ones in sugar syrup), still slightly frozen. The berries will cover the cracks and everyone will love it. I would like to make this cheesecake, but would like to half the recipe. I have an 8-inch spring-form pan; should I use this? Or would a different size work better? Also, all my spring-form pans are dark non-stick. Is there a limit to how high temperatures these types of pans can go? if you go with 8" you'll need more than half the crust - 10" is 78+ sq inches, 8" 50 sq inches. also be aware it will bake faster - so keep an eye on on it - do not go blindly by a timer. I have a set of 3 springform pans that may have come from a garage sale. Who knows - but I don't know what sizes they are. I measured the inside diameter and used the pan that measured 10". But when I filled the pan with the filling, it came to about 3/4" from the top. The pans are 2-3/4" high inside. Are my pans simply taller than the ones used in the photos? Or did I measure the diameter incorrectly? Subject: Re: Measuring pan size? The pans are 2-3/4" high inside. Are my pans simply taller than the ones used in the photos? I think your pans are just taller. The one in the photo is 2-in from base plate to rim (2.5-in if you measure the width of the band from the outside). My MIL and I were going to use your recipe to bake my first ever cheese cake, but she forgot to buy the heavy cream. However, we omitted the heavy cream and used a recipe almost identical (except for the cream) and used your cook times and tips/tricks. After 45 minutes into baking it cracked a little on a 1/4 of the cake, about 4 to 5 inches from the edge. I didn't realize until I took it out to run a knife around the edge that I forgot to grease the sides!! I am staying optimistic that that is the reason it cracked. Either way your cook times are on point. I have a question. I was reading that a good time to take it out is when a portion of the center hasn't domed yet. Only three or so inches from the edges had domed by the time I took it out at 1 hr and 35 minutes. The thermometer literally crawled from 120 to 150. Should I have left it in for the extra 5 minutes? This is the same ingredients I've been using for 20 years. Incredible goodness in every bite. I'm at home today baking 3 of these for a friends wedding tomorrow. The second one is in the oven cooling for a couple hours. Here's the deal! Every one of these I've ever baked (LOTS) has cracked but one. That one I made for my daughters birthday and it was perfect. It was a wonderful thing. The funny thing, now, is that my Golden Retriever ate about a third of it before it was even cool. I have no idea why it didn't crack. I built it the same way as all the others. This morning while the first one was in the over I drove to Ace and purchased a $15.00 digital thermometer. The first cake I took out at 152 degrees. After cooling it had very slight cracks. The second one I waited till it got to 155 degrees. This one looks the same. Very small cracks. One of the best as far as cracks go. Bad dog. No cheesecake! The third has yet to be started. I'm going to push it to 157 degrees. This is after only the first 10 min. at 500 and 60 min at 200 degrees. Not sure how I could keep it in the over for another 40 min. without it being over cooked. My original recipe came from a great book "The Joy of Cheesecake" and they call it "The Heavy One". They recommend cooking for 15 min at 450 degrees and then 60 min. at 200. I like this one better. Anyway, the cracks have Never affected the taste at all. I really like the digital thermometer idea. Thanks for a great site. I enjoy the layout at the bottom for directions. This cheesecake is the absolute best ever. When I was a kid 50 years ago my sister and I use to get excited when my mom would buy one of those frozen things. I think they were made by Sarah Lee. Wow, I wouldn't get near one of those things now. Silly Kids! The times when I've used thermometer in the cheesecake it cracks where the thermometer went in. Is the thermometer the cause of the crack or would it have cracked anyway. I'd like to try it again but I am nervous about cracking. Um, I have created a couple cheesecakes before, and I am not sure what the texture of the crust is supposed to be like. Crunchy or soggy? Also, Alton Brown recommends using a 3 inch thick cake pan instead. Do you have any suggestions? "crunchy" is a good description - but not so hard as to be "crisp"
>>inch thick cake pan instead. a pan three inches deep? cake pan vs spring form? I have made SEVERAL of these for the last 2 years,,, here is what I have learned/experienced, and hope it helps. #1) Have ALL ingredients at room temp before starting. #2) I use a "water bath" for my cheesecake, and the only 1 that ever broke/split on me was my very first one that I did NOT use a water bath for,,, hmmm. *** I take a LARGE broiler pan, like the one you use to cook a turkey in, and fill it full of hot water. Then I put it on the bottom shelf inside my oven, and let it reach the 500 degree temperature. Then I take the ready to bake/prepared cheesecake and put in on the baking sheet and on the middle shelf in the oven. DO NOT OPEN THE DOOR ONCE YOU BEGIN BAKING, AND DO NOT REMOVE THE WATER BATH FROM THE OVEN UNTIL THE 1 HOUR 40 MINUTE COOKING TIME HAS FINISHED. I just wanted to know what brand spring form you used? Is it stainless steel? 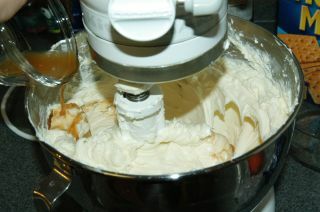 In a large deep bowl cream cheese until smooth, add sugar, cornstarch and salt mix until smooth. Gradually add the eggs and egg yolks (2 at a time) mixing well and scraping the sides and bottom of the bowl after each addition. Stir in the remaining ingredients And blend to a smooth batter. Pour filling into prepared pan and place this in a larger pan filled with water to the depth of approximately 1 inch. Bake at 425� for about 15 minutes. Remove from the oven and let cool while reducing oven temperature To 325� when the oven has cooled down return cake to cooled oven and add more cold water to the pan, let bake for 1 hour and 30 minutes or until point of knife inserted in the center comes out clean. Cool and chill in pan for about 2 hours before removing sides of pan �then chill. I am totally psyched to have found your recipe. I am in Germany and want to show my friends what NY style cheesecake is like. German Kasekuchen is wonderful, but worlds apart from the rich cheesecake we in the US know and love. So, like everything from Chicago deep dish style pizza to chocolate chip cookies, I have to learn how to make it myself. I never baked or cooked much in the US, but it is sooo fun! The cake is cooling now, and apart from having a really brown crust and reaching an internal temperature of 185, all seems well with no cracking so far. I did use a walnut crust from another recipe, and I will post more details if it turns out well. Pecans would be better, but the nut selection at my local supermarket varies. Subject: Sorry, you got this one wrong! Baking for a full ten minutes was a huge mistake, burned the cheesecake top, followed directions to a T, have been making cheesecakes for a while, not great advice. Sorry!
! Is it supposed to be that way? It appears to be rather liquid inside. Will it solidify more when it completely cools? sounds like it did not finish baking - it probably will not set up further as it cools. oven temperature dials & indicators are frequently off - so you need to go by how it cooking than just the clock. Regarding the texture, I am getting conflicting feedback from this forum. Following the recipe exactly, is this a fluffy cheesecake or hard and dense cheesecake? I also would like to know if using the flour would result in a more firm, dense texture...............this is not what I would like! As the flour is optional, are most people just opting out (as in, not using it)? As far as pans, I have only dark, non-stick spring-form pans...........generally, I am directed by recipes to reduce the temp by 25 degrees F if using dark non-stick. Should I do that with this recipe as well? Further more, I have read that dark non-stick pans have a heat limit, which if passed will cause smoke and other such "fun". Does anyone know if 500 degrees F is doable using dark non-stick pans? If anyone can answer these questions, I would be most grateful. Thank you in advance! the recipe is for a New York style cheesecake - those are to the dense side - not a whipped frothy style. the flour will stiffen the mix - it's likely you'd not know if it was made with or without the flour. cheesecake is best done a lower temps - the initial 500'F temp is not maintained. the 500'F is safe for non-stick pans for a short period. keep the 200'F baking temp even with the dark pans. Teflon aka PTFE starts to off-gas at about 400'F - but in 10 minutes, the pans won't get there. 1. Be very careful of the order in which things are mixed. The cheesecake layer in my family's concoction uses only four ingredients (cream cheese, sugar, eggs, and vanilla) but they definitely need to be mixed in the right order. Mix cream cheese with the sugar first, and the more you can beat it together, the better. The sugar crystals cut up the cream cheese so you don't have solid lumps of cream cheese in your final batter. Then add the rest, a little bit at a time. If you are careful at the first (and mix with a spoon in each hand to squash out any unmixed lumps between the spoons) it isn't that bad. At each stage of addition, make sure that you have your batter as smooth as possible. 2. The softer the cream cheese is, the easier. You can plow through cold cream cheese by dumping the sugar on top of it and scraping down the sides, but yes, your muscles will definitely tell you you've been working the next day. This cake is awesome and so easy to make...once you follow the directions it comes out the same way every try. First of all, great recipe! I made it a few times in a gas oven that never seemed to get hot enough for anything, and tonight I'm making it again in a nice, reliable electric oven. I have made this recipe 4 times (one is in the oven right now). It is a great recipe. My first one had no cracks at all, the 2nd and 3rd did, but what does it really matter, you are going to cut it anyhow. Follow the recipe exactly, and you should have no problems. I try to make them on days when the humidity is high, if you live somewhere that this is not possible, use the water bath. Room temperature ingredients seem to work best. Give this recipe a try, you won't be disappointed. Thank you very much for such a great recipe. The Chessecake turned out to be the best cheescake I`ve ever had in my life. Excellent recipe! :) I will definitely make it again and again. seen and I have been cooking for 47 years.THANK YOU!!!!! A cheesecake I've just baked, developed a medium-sized crack around the center, as it was cooling. My first thought was "overbaked". I took it out of the oven when the thermometer read 71� C, so maybe I should have taken it out a few minutes earlier. But after cooling and chilling it, when I finally cut into it, I was surprised to see that the filling was very soft, almost mousse-like, particularly in the center, where apparently it has not fully set and was liquidy, even. I can't figure it out. If it hasn't fully set when the temperature reached 71� C, should I have baked it longer? And then why did it crack while it was cooling? (I do have an oven thermometer, and try to keep the temperature as accurate as possible). I hope you can help me understand what went wrong, and thank you in advance! I'm going to assume you are asking whether or not the instructions written in this recipe are correct and the answer is yes. If the real question is how do you reconcile your mum's instructions vs the instructions here on this site, then there's no real answer. Perhaps your oven runs hot and gas mark 2 (normally around 325F or 165C) is actually higher than normal so anything above that burns food that is kept in there too long. There are oven thermometers that are able to handle the high heat of an oven and can give you an idea of whether or not your oven runs hot. They cost about $3-4 here in the US and I can only assume they would be a similar price if available in your country. If your oven does operate in the expected temperature ranges, then simply bake at Gas Mark 9 for ten minutes, and then lower to Gas Mark 3 for the rest of the baking process. I bake a lot of cheesecakes and I go by this one every time.I never have a single crack and the texture is perfect.The only thing I do differently is bake at 225 for an hour and 15 minutes.When its done I turn off the oven and crack the oven door to let it cool completely.I use this recipe as every base for my cheesecakes. So I made the cheesecake it wasn't bad since I had to compromise on the temperature it could be the reason I had faults but its wasn't that bad the cheesecake collapsed in towards the middle and one side didn't look right. LOL meteorism. Haven't heard that word in ages! So the cake looks & smells fantastic but I've made a million & one cheesecakes so I had to make it differently to make it my own. First of all use a nut such as pecans for the crust, or choclate cookies like oreos crushed if making it a peanut butter cream cheese cake, always better. Also be playful with your recipes & substitute the whip cream with twice as much white chocolate mousse & layer in your favorite fruits then top with more fruit after it has chilled or on individual slices if you're like me & want to experience e something different with each serving. Great original recipe to start with & very easy to alter or experiment with to make something truly special. Thanks! They crack because they have cooled too quickly or stuck to sides of your pan. Tip 1 - Turn the oven off 5 minutes prior till done & let your cake cool in there for a couple hours before refrigerating. Tip 2 - Line you pan with lightly greased wax paper to prevent it from sticking to pan. This will also make cleanup easier and should you need to move the cake to a new serving tray the wax paper will slide right off the pan without fear of losing any portion it or causing it to fall. I have to tell you a story Michael Chu. My dad loved this recipe, his name was also Michael and he was a pilot for Scandinavian Airlines. He planned to open a B&B and wanted to sell authentic American cheesecakes to his guests. To know how much it would cost to sell them and to know how he would bake a cheesecake so it would be perfect, he started baking cheesecakes from your recipe (when he was a pilot and divorced, he had a lot of free time, it should be added). Dad bought special baking molds from the U.S. (because he was a pilot, he went there often) and he baked many chesecakes ... so many that he began to give them away to the nearest pub (where they were given away as a dessert for their VIP guests) so he did not have to throw them away. These cheesecakes became really popular in our family and among our friends. People who said they did not like cheesecakes, loved them. He was sadly concluded that it would be too expensive to sell cheesecakes for his potential B&B so he ended up baking them. Around the same time he received a terrible news, he had cancer, and my father passed away in June 2011. One time he showed me the website that he found the recipe. "Chesecakes for engineers," he said proudly, and he showed me the recipe and told me how much he struggled to make it as perfect as possible. I googled my way to this page and found the recipe and now, I am going to give it a try and bake a perfect cheesecake. I just wanted to tell you one of my memories that I have left, of my fun (and restless) dad, and tell you how your recipe has become a fond memory for my family. Oh wow... That left me with tears in my eyes. I hope you have many years of successful cheesecakes and pass on the recipe to as many people as you know. I'd imagine your father would love that you are sharing his cheesecake with others! Hello. I've known of this site for years, and had not been back for quite some time. I've used the CI recipe for years before discovering this site, but took the tips in this thread to keep me on the right track as well. My dad also had cancer, and passed away just now. I hadn't made NY cheesecake in awhile, but just made one. After which it delved me back into deep research about NY cheesecake, and it brought me back to this site, reading the whole thread again and seeing how it has slowly grown. What do you think about in stead of putting the cheesecake in the oven, we cook the custard on the stove until it reaches 150 degrees and then pour it on the pre baked crust and leave it in the fridge to set? Subject: I finally found it! This past year I've been attempting NY style cheesecakes and have looked all over the vast internets to find a really good recipe... I have attempted many in this time, and one of them was the recipe from this site. People, if you read any comments hopefully mine is the one you read, b/c this cake is AMAZING!!!! I lost the site and have been trying to find it to bookmark it again! I'm soooooo happy I remembered most the instructions being so different than most other recipes! So simple and laid out to make the perfect cheesecake!!! THANK YOU GUYS!!!! AWESOMELY AMAZING!!! HELP..... I love this recipe but would like to make them in 4 inch pans and I am sure that there must be a temperature and baking time adjustment..... Can you help? Just wanted to say I found this recipe a couple of years ago and have used it multiple times. The cheesecakes always turn out great! My sister-in-law, who doesn't care for cheesecake, asks for one of these for her birthday. :-) I must eat gluten-free, so I make (or you could buy) GF cookies for the crust and leave out the optional flour in the custard. I bake as directed, then move it to a table and cover with a large stainless steel bowl for several hours. This seems to help prevent cracking as well. Anyway, thanks for a great recipe! I am looking to make smaller cheesecakes to give as gifts at Christmas and such. i have been baking Lindy's cheesecakes for years and through trial and error come up witha pretty good product. I mingled in raspberry tart (12 oz of fresh raspberries boilded down with cornstarch and suger to a thick gellatin/puree (strained of seeds)) and melted white chocolate (mixed in after last egg). I grabbed the idea from two separate recipes and now have an awesome White Chocolate Cheesecake with Raspberry Swirl. Now want to land the perfrect ten and make three smaller cheesecakes. Anyone try this yet and have success. Temperatures and Times? Mike, your site is amazing. I love making cheesecake, but encounter the same issues as everyone else. I recently watched a video on TV of a professional chef preparing a cheesecake. He was very much against using any kind of mixer or whisk. Instead, he used his hands (wearing food grade plastic gloves) to mix all ingredients which had been brought down to room temperature. His opinion was that this method did not allow any excess air or bubbles into the mixture which ultimately would prevent cracking. I have not tried it yet, but I'm interested in your reaction to the hand mixing method. I would not be surprised if hand mixing reduced the trapping of air. I'm not entirely convinced that it is the air that causes the cracking instead of uneven contraction of the cake as it cools, but it might be the cause. I'd be interested in hearing anyone's results on this. If I use a 12 inch springform pan do I need to change the cooking times? Do you run a knife around the edge of the springform pan or is it ok without that? Fyi. I am in Australia and it is common that the ovens have the elements at the top of the stove instead of the bottom. I tried these temperatures in this sort of oven and by the time I got to 7 minutes at 500 deg F (250 C) the top of the cake had burned even though the cake was placed on the middle-bottom rack of the oven. there's a couple messages throughout the thread - the consensus is it works the same but it will take a bit longer to bake finished at altitude. I just took my cheesecake out of the oven, first off, I cooked it as long as it is suppose to be baked, I am at high altitude. Right after I tested the temperature and shut the oven (It took another 30 minutes to finish cooking) It cracked really bad, so it looks terrible, because at 500 degrees for the 10 minutes on the 2nd rack from the bottom, the top is really brown and the sides are almost black. I was frustrated from 4 minutes into baking because I watched it get darker and darker and I could not do anything about it for fear of completely ruining my cheesecake. It was still gooey and 130 degrees at 1 hour and 40 minutes. I had to test the temp several times so I didn't overcook (did it anyways, the temp went from 140 up to 160 degrees in probably 5 minutes. Grrr. I increased the vanilla to 2 tbsp and our business has huckleberries, so either I will make my own sauce, or use our Huckleberry syrup or preserves on it. I will let you know how it tastes tomorrow. Crossing my fingers for it to taste as amazing as everyone else's. I also scraped vanilla seeds into it for the flecks because we can't sell the drier vanilla. I make my own vanilla extract to use these pods we cannot sell anymore. I use distilled vodka and make everlasting vanilla extract. It is thick and very flavorful. Anyways, I put my own twist on it, because I LOVE my vanilla extract so anytime I bake, I have to use the vanilla seeds and/or the seeds. I hope that didn't ruin the cheesecake flavor. Out of curiousity, can any of these changes ruin the cheesecake? I am not a scientist. Did I mess up the cheesecake by tweeking the recipe? Like the cracking and burning? Sorry for the lengthy post. I wish you would make a 2nd recipe for high altitude. No one has any high altitude recipes. PS, if it turns out really good, can I post this recipe on my website? I would need to tweek the recipe, to add the vanilla. Always looking for recipes using our products! Even if the huckleberry syrup or preserves taste good. Do you have a great recipe for candy cap mushrooms? Or using vanilla that I can use on - Or any other products that would work with our products? How to make a sauce with huckleberries? Huckleberries are sweet and tart! So a recipe that would cut some of the tart and bring out the sweet? I wish there was more information on line that was the same. Some say that we increase this and decrease that, and then ones that say not to change anything and bake longer. I wish more people that would post recipes that are good, such as the New York Style cheesecake. I would like to know that exact baking time that you would need to make it work. Cheesecake is very time consuming and not cheap to ruin. The first one I made, I made the mistake of putting very little sugar because of the way it is written. Imagine using 3/4 cup of sugar when it calls for 1 3/4 Cups! It is very very dense, you cannot cut the crust, and okay tasting, just not as strong. Looking forward to drizzlingover it, it may make it perfect since I didn't put enough sugar over it. I've been looking for a good cheesecake recipe and I found this one in January 2015, and it came out amazing. I couldn't be more pleased and all of the comments from other bakers has helped. I lost this recipe until just today I finally found it by Googling 'cheesecake recipe that starts at 500�' and I cried when I found it because I've read other recipes and just didn't even care to trY. My husband loves this cake and his birthday is tomorrow. thank you thank you thank you for sharing this wonderfully delicious recipe and your skills on how to get it perfect. If I could I'd hug you! Thanks again.....Sarah. Your NY Cheesecake recipe appears to be of the light and fluffy variety. But I love the very dense cheesecake such as those from Carnegie Deli (RIP!) and Katz's. I've never seen a recipe for the ultra-dense cheesecakes like those, nor do I understand what makes a cheesecake fluffy and what makes it dense. the cream cheese in the light&fluffy types is whipped to incorporate air - basic recipes are similar. the denser varieties are mixed but not whipped. This is not a recipe for an air-filled cheesecake. This is a real, heavy, Junior's of Brooklyn style cheesecake. I make about 5 or 6 of these things every year for various family shindigs and here's what I've found, mostly thru trial and error. Run your mixer at the lowest possible speed. Running too fast will incorporate air into the mix and fluff it up. If your mixer stalls at low speed, get a better mixer. Oh, yeah, don't try to hurry the mixing. I usually run the mix cycle for at least 15 minutes. Scrape the bowl while mixing. Otherwise, you're guaranteed to have cream cheese globs in the cake. I always use jumbo eggs for everything I make. Works great in this recipe. Experiment with the vanilla. I always double up and everyone loves it. Don't use the imitation stuff. The flavor WILL be different. Head for your local Goodwill or Salvation Army store and pick up one of those tiny food processors that were such a fad a few years ago (grind fresh spices, grind fresh coffee and so on). The size of those bowls is perfect for one wrapped pack of graham crackers. That processor will grind it up to powder. While we're on the mini processor kick, ignore the melted butter. Once the crackers are powdered, add the unmelted butter to the processor and run it until the butter's "distributed". It will act as a binder for the powder. Coat the pan with some baking spray. Since the butter acts as a binder, don't worry about pressing the base with a flat bottomed whatever. I still can't find one. Just pour the batter out slowly. The first cake I made, I pre-baked the crust per instructions. The second, I didn't. No discernible difference. I've tried to incorporate things like strawberries, raspberries, chocolate and so on with no success. Maybe someone can give me a hint. I have spread the crust with M&M's before pouring in the batter. That one worked very well. Follow the times exactly. This is another thing you can't rush. Fight the urge to open the oven door to check things out. Once the cake is out of the oven, let it rest. On the counter until room temperature, then into the refrigerator. Putting it in the fridge immediately is guaranteed to crack the top. I have been using this recipe for about 10 years now. It always comes out well, but I made a change a few years ago, that I now have to always do at my family's insistence. I slice up 3 granny smith apples, lightly saute them with a very small amount of brown sugar, then put the apple mixture in the bottom of the springform on top of the graham crackers. Then pour in the cheesecake mixture. Bake as normal. Just don't use too juicy an apple pie filling as it tends to want to then overcook the graham crackers. Granny Smith Apple Pie Cheesecake!